I have sad news to bring to our followers Mary has finally lost here battle with cancer, She passed away on Sunday Nov 18 2018. She will be missed but never forgotten and the earthship will be finished to the best of our ability to keep her vision alive. I will try to up date the website in the near future but she was the genius behind the website, So it will probably not be as polished as it has been in the past but I will try. This past fall has been a tough ride for me. The lump that I had discovered earlier kept growing no matter what kind of alternative treatment that I had tried at home. To be honest I don't have much faith in our medical system. They are all drugs and surgery. I do my best to avoid going to the doctor and do what I can at home. In September I could not avoid them no longer. I ended up with a 12 day stay at the Ozark Medical Center in West Plains. During this time in the hospital I had agreed to go through with radiation treatments to treat my now biopsied breast cancer. I ended up having 42 sessions within a 14 day period. Even though I was given mega does of radiation I seemed to fair well with it. Since then the doctors have been keeping an eye on two tumors that were not treated with radiation the first time and have found them to be growing. I am now in the process of going through more radiation. It has taken awhile for me to recover from all that has happened since last September. To be honest I focus on what I felt like doing to help me with my healing. 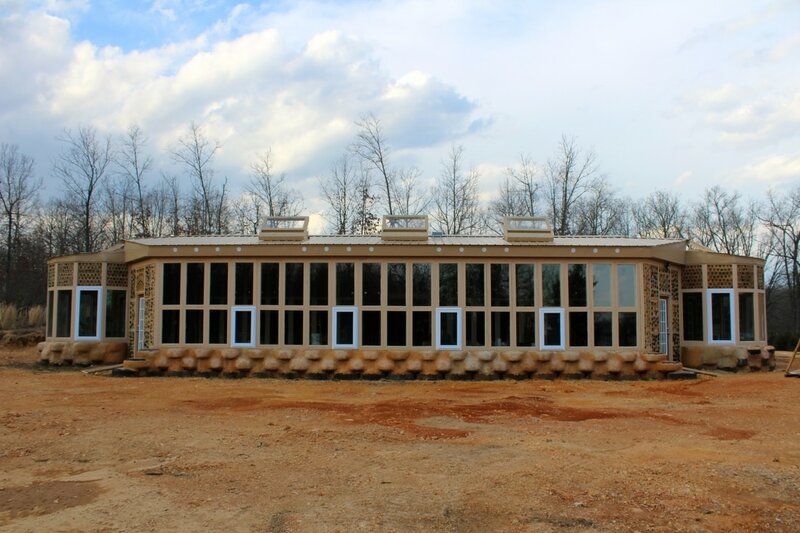 Even though we have made progress with the earthship. It has been a very slow process. Allen has had to take care of me when I wasn't functioning much at all. During this whole process I have given my heart to Jesus and feel that I have developed my relationship with God tremendously. Jesus is the Master Healer and Master Teacher and is in control of my healing process. My outlook has changed and now have a different perspective on life. I am fortunate that I have breast cancer medicaid to cover the cost of my bills. Unfortunately they don't cover the supplements that I am on that are helping me with my recovery. These supplements are not cheap and as most people with cancer have found that your savings account gets depleted. I now have set up a T-Shirt Fundraiser to help raise funds so I can continue on my supplements and continue with my healing process. I designed these T-Shirts with the intention of also spreading the Love of Jesus to others. If you find it in your heart, I would like to ask for your support and even if it only means to share this post with others. The shirts shown below do come in a variety of colors. Your thoughts and prayers are continually appreciated. Thank you to our patient followers for keeping the faith that we will finish our home. New designs and current fundraisers will be posted off to the right hand side of the blog. Thank you for your support. Our work in progress has been the bathroom shower and bathroom walls. Below Allen is working on the bathroom wall. 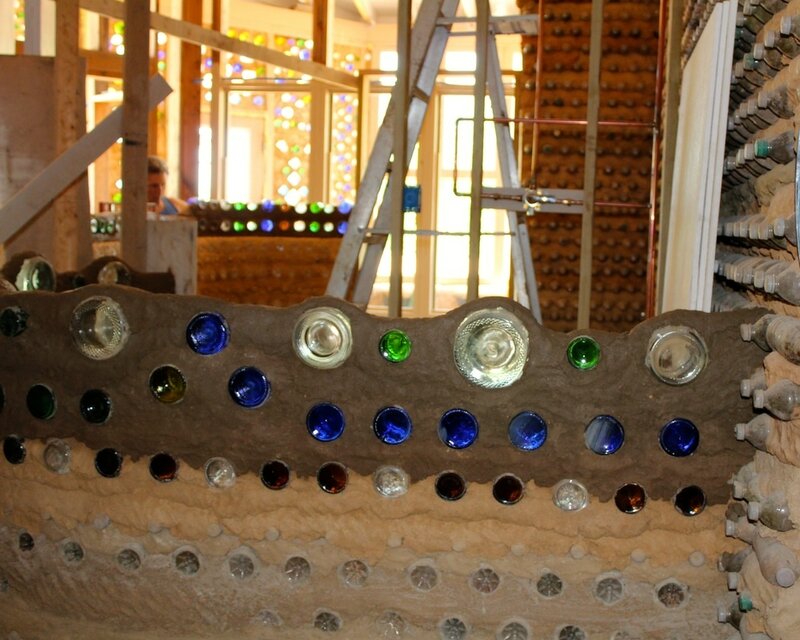 When constructing with glass bottles we have found that it works best to just do a couple of rows at a time. This allows time for the bottles to set in place and the mud to harden. The bathroom will end up being a 7' x 5'. This does not include the shower. The shower will have it's own space. Our shower is 6' x 5'. Many people have asked why such a big shower? My answer is because we can. Being stuck with a 18 inch x 2' shower for 4 years where you couldn't stretch very well to wash up led us to this. We now have lots of leg room. Why work on the greenhouse first? The planters need to be dug out in order to have a functioning bathroom because of how we are going to use the grey water. This means digging holes in our greenhouse for the planters. 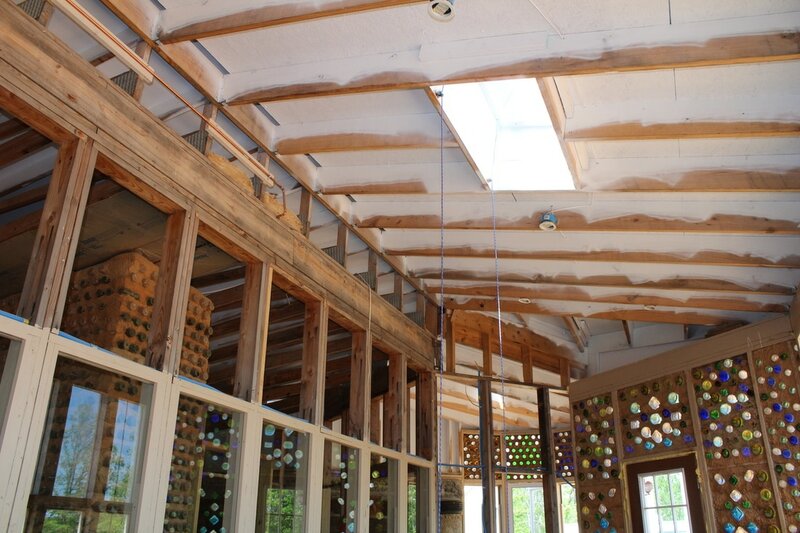 The greenhouse has the tallest ceilings of the Upcycled Home. 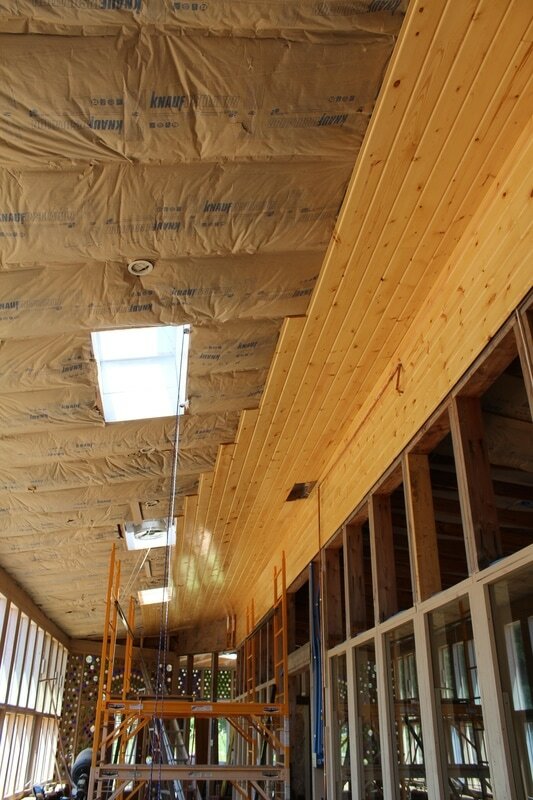 We want to be safe in all of our construction so it made sense to work on completing the greenhouse ceiling first. Then we would not have holes in the floor to work around if we had waited until later. With the humidity issues that we have experienced we had to spray the ceiling for mold and mildew. The photo above shows the west greenhouse, west sunroom and the west living areas in the house. This is the kitchen and living room area. This is the east greenhouse, east sunroom and east living area's. 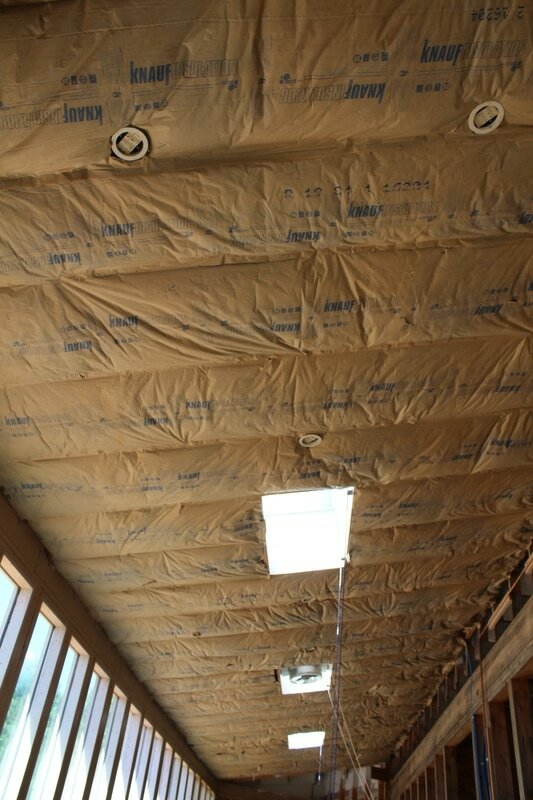 Next is the insulation and working around the lights and skylights. 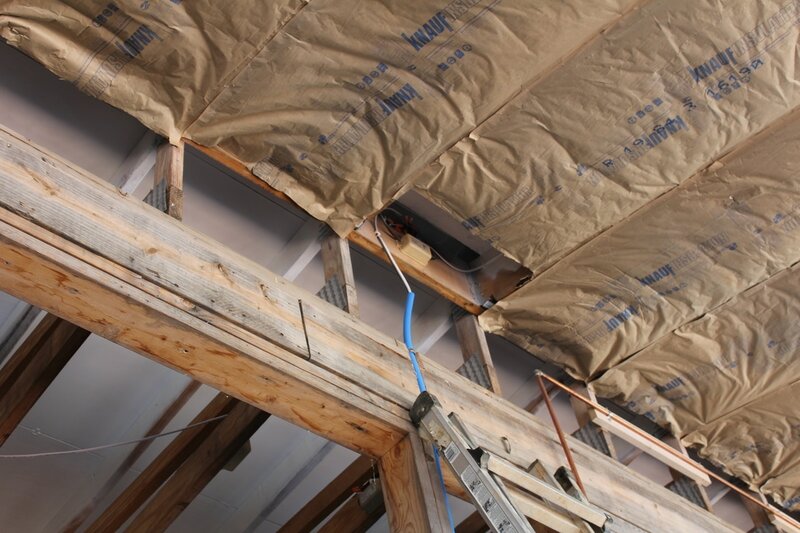 This is R19 batt insulation. Where there is a junction box we need to have the ability to get access to it. That is to code in Wisconsin. Since we live in a county in Missouri with no codes, Allen apply's what codes he knows to our home. Even though at this current time they are not needed. We want a safe home and if it is ever checked we will feel better that we did what we knew to do even if it was from Wisconsin Living. ​Allen will make a special cover that will have insulation on it that he can screw up and take it down in the event he needs to get at it. Our Upcycled Home has many different angels to it. So you can say it has been a challenge to figure out how to make things come out to look nice. Allen's innovative skills keeping coming through for him as he conquers the challenges that he faces quite often. He has had to build out the structure of the two walls coming together here. One coat of interior/ exterior Urethane was applied first then Arron sanded the boards before the 2nd coat was added. Allen is applying a Helmsman, Indoor/Outdoor, Spar Urethane made by Minwax. This kind of Urethane is oil based. We chose this product because of the humidity that we will have in our greenhouse. 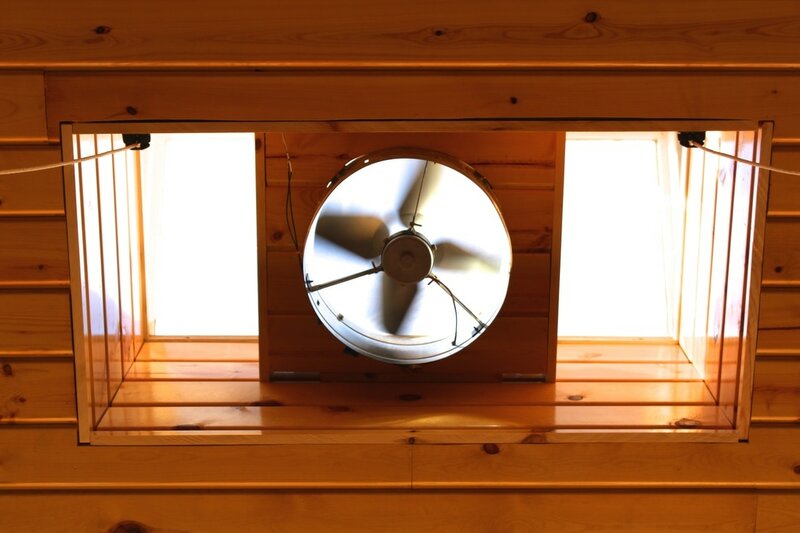 This brand will protect the wood from the sunlight, rain, moisture and temperature changes. At first we thought that we could go with any exterior Urethane. We were told by a Menards Associate that the exterior Urethane is made to be out in the sun. If not touched by the sun it will discolor and not be effective. Word to the wise if you don't want to redo your project later on to actually use a product that is meant to be used in the way you need it to. For this product we reccommend using cheap brushes that you can throw out. That is not what we usually would like to do it. We reuse what we can. We decided to do this after Allen cleaned out his expensive brushes with Mineral Spirits the first time and he found his oil brushes stiff and hard and not able to be reused again. We value our time so at times you have to decided which is more important to spend your time on. These have to sit outside for 24 hours before you can use them. This has been a challenge here lately. With so much rain that we have been getting when we have two day's of dry weather this is the first thing we will do. 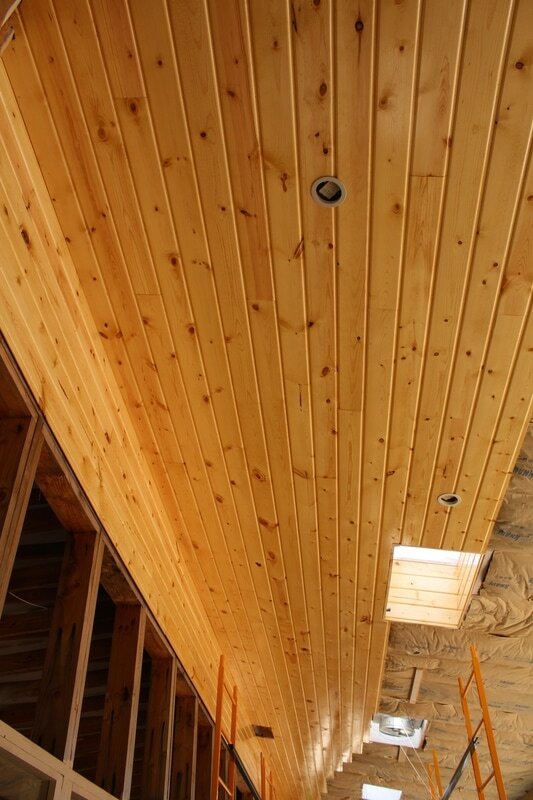 All paneling or ceiling work requires the skill to work around obstacles. 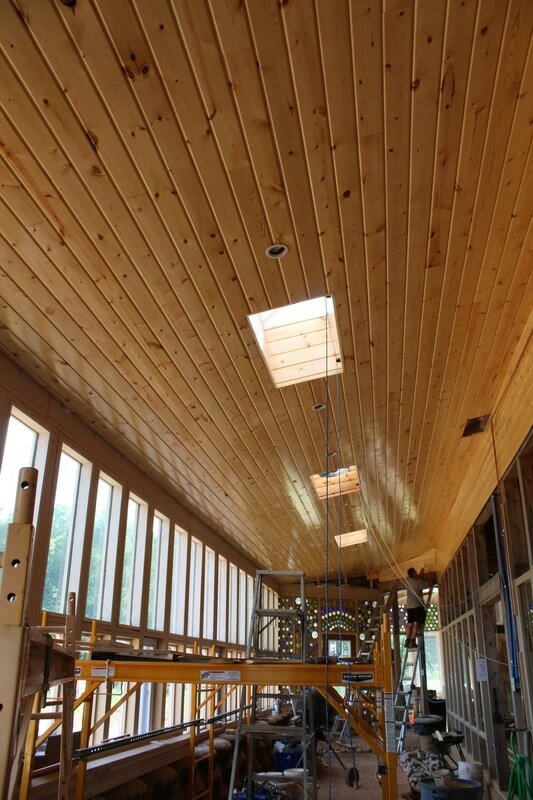 For this ceiling work it has been lights, skylights and junction boxes. 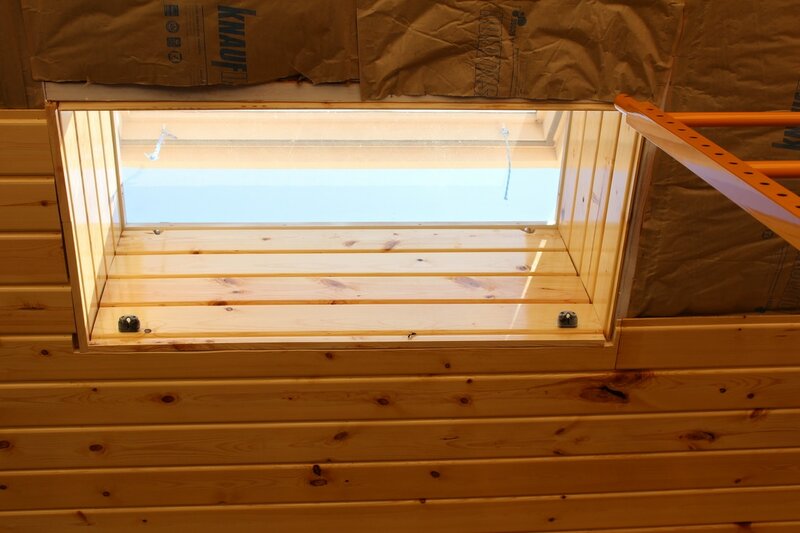 Allen added the paneling to the inside of the skylights so it will look uniform. Allen gave the exhaust fan a nice face lift to match the ceiling work too. Please note that this photo was retaken in the morning so the color of the paneling looks a bit more orange than what it normally looks like. We decided to go with a gloss finish. I personally like shinny things. The gloss coat will all so help in reflecting the light from the sun to make the room and home much brighter. As you can see down where Allen is on the west end the sun shinning in and reflecting up on the ceiling. This ceiling will be easier to clean. We won't have to repaint it either. Putting up a ceiling is hard on the neck to begin with let alone to have to redo it by repainting every so often. Not in this earthship. 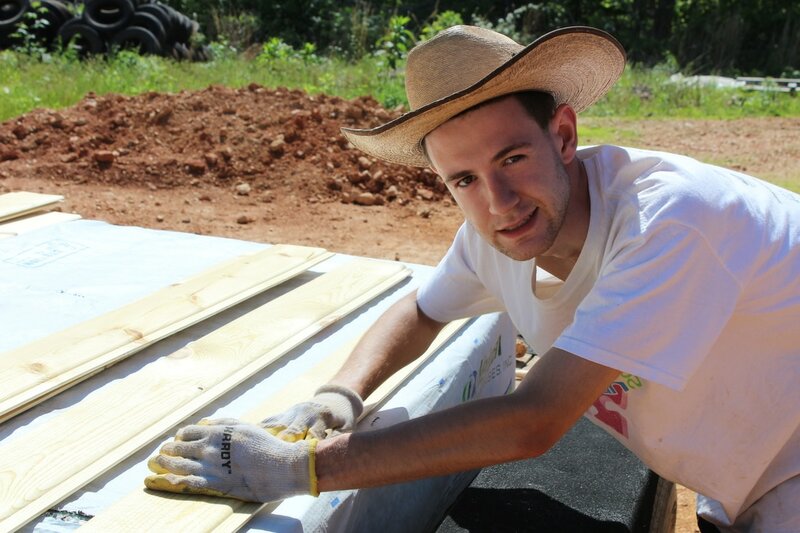 Allen using a air nailer to install the boards with. This was a cheap $14.95 air nailer that Allen bought from Harbor Freight Tools. With only using a portable 3 gallon air compressor this system worked wonderfully. 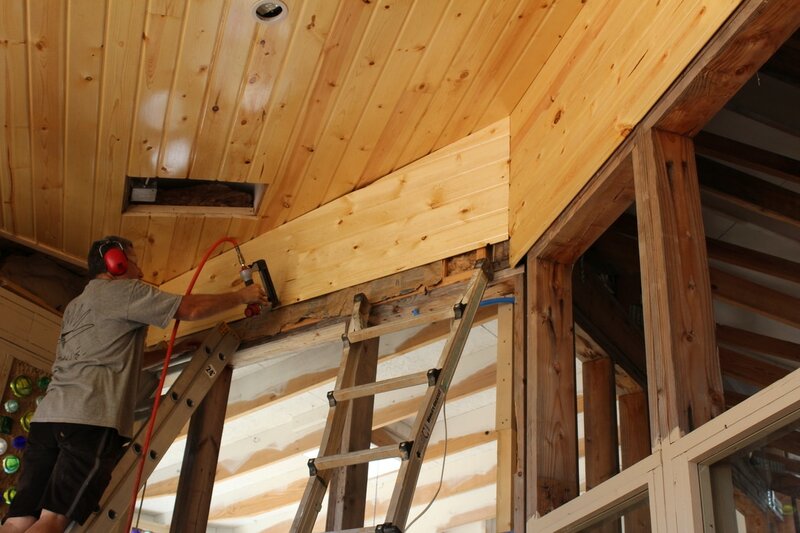 The adjacent walls that go into the east and west sunrooms are getting paneling down the side of the doorway. We needed to apply a finish layer of some kind to our exterior bottle wall so we can add the paneling to the sunroom doorways. We decided to apply a papercrete finish coat. Why papercrete instead of stucco? For insulation purposes. From the papercrete mixtures that we have been using our papercrete so far does not crack even in the extreme climate of being exposed to the sun, wind, rain, heat, cold and hale. It is cheap to make and easy to work with. Papercrete is all so fire proof. Two draw backs are that papercrete does take a while to apply. It took two whole days to apply one batch of papercrete to the east and west sunroom entrances, and takes about a week to fully dry. Now most cement mixtures do not give you hours to work with and still be pliable. Well, our papercrete formulas do. The papercrete is mostly paper and water. So as long as you keep it wet it will stay pliable to use. 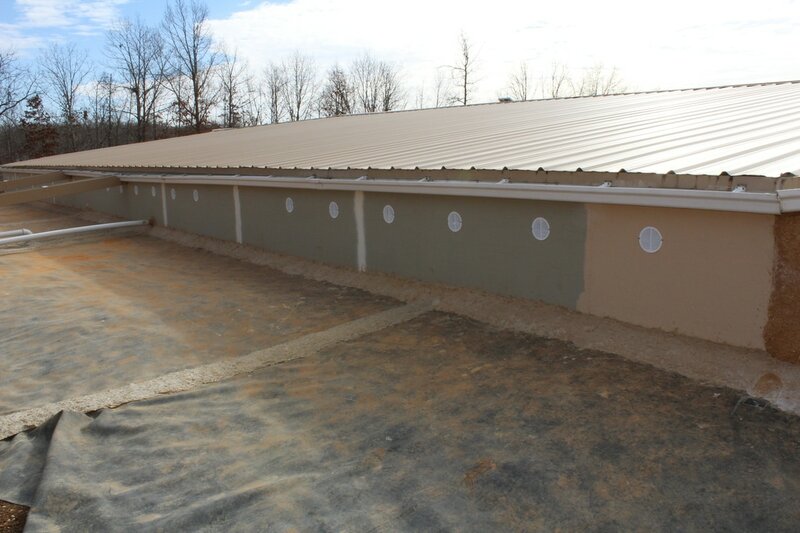 The papercrete finish formula is a different mixture than what we have been using before. 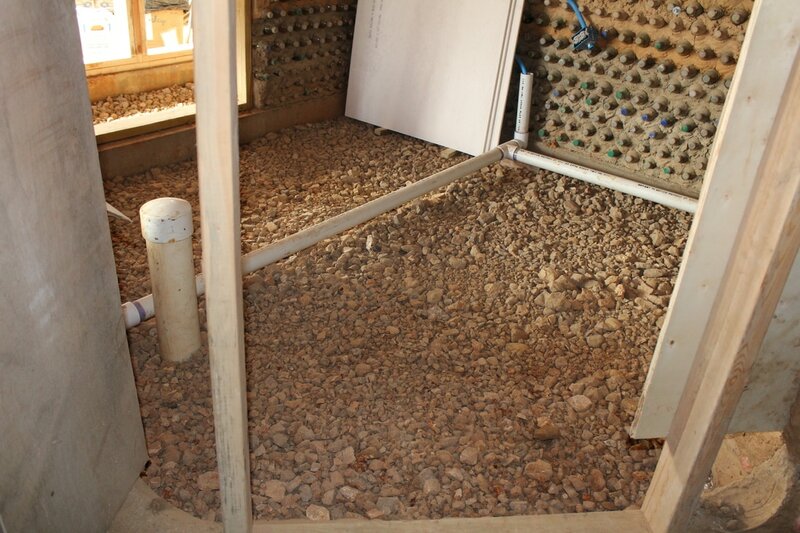 Our regular papercrete mixture has water, cement, shredded paper, borox, straw and clay with small stones mixed in. This is a great mixture for packing and filling in a huge gaps. It turns out rougher. And we don't have any issues with the next layers sticking to it. 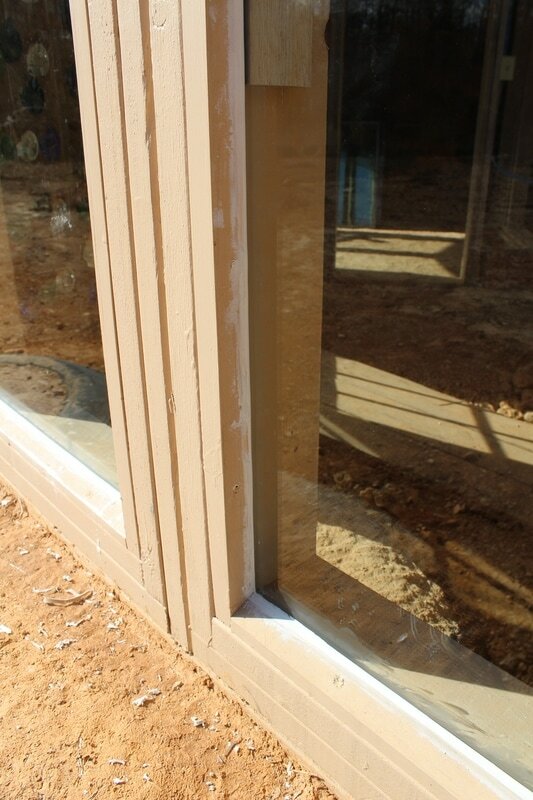 The final papercrete finish coat has everything in the regular except straw and small stones. The clay was finely sifted with no stones in it. I have to admit that this papercrete finish formula is an experiment. We never made it before. We did not know if it would stick to the bottles or if it would pull away from the glass as it dried. We took a chance that it would work. You may think it risky to do this but I have to say this whole house has been a experiment from the get go. These photos were taken when we finished for the day. The papercrete will dry lighter as it dries. The photo below is the adjacent wall with the paneling now attached to it. The space above the doorway will be a window with the door being a glass door. 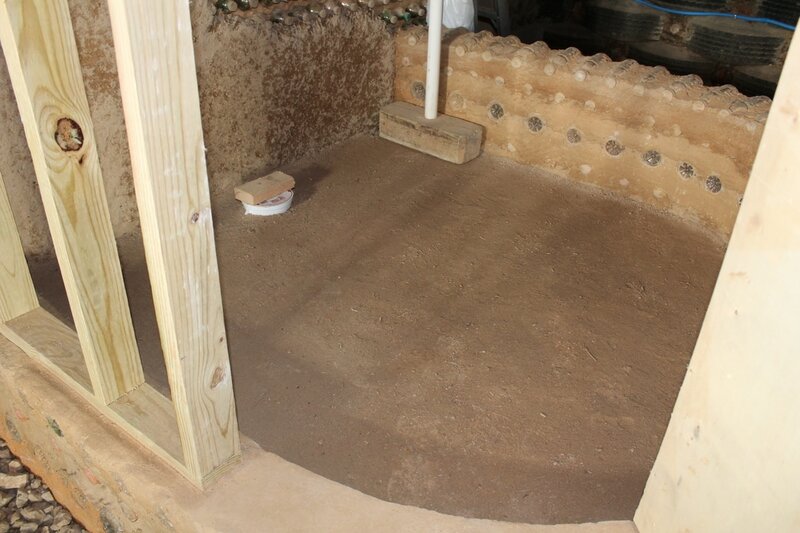 The photo above shows the papercrete finished layer all dry. It does have a texture to it, has stuck to the bottles well with no cracking, and is very hard to the touch. Allen adding a papercrete finish to the west sunroom wall. 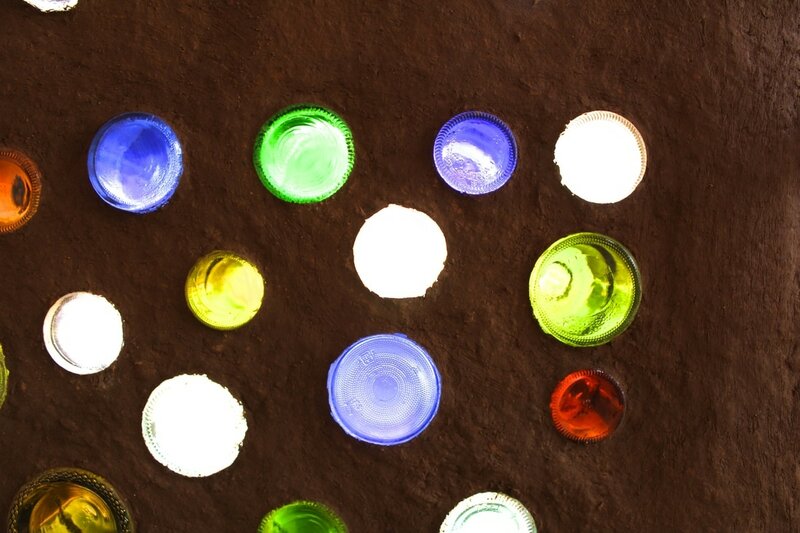 The papercrete is applied flush to the edge of the bottles. The photo above is the east end of the greenhouse. The photo below is the west end. The next to be worked on is the trim in the greenhouse, finish the papercrete bottle walls, and finish building the bathroom walls. Sometimes it can take a while to complete a project on our home. At times we are working on several different things at once. A lot depends on weather and how much power do we have. With winter we need to conserve our power at times because of lack of sun. Here in early spring we are in the rainy season and have lack of sun again. We are not used to how much rain we get in Missouri compared to Wisconsin. And even though we are now enclosed and out of the weather we are still dependent on the weather. 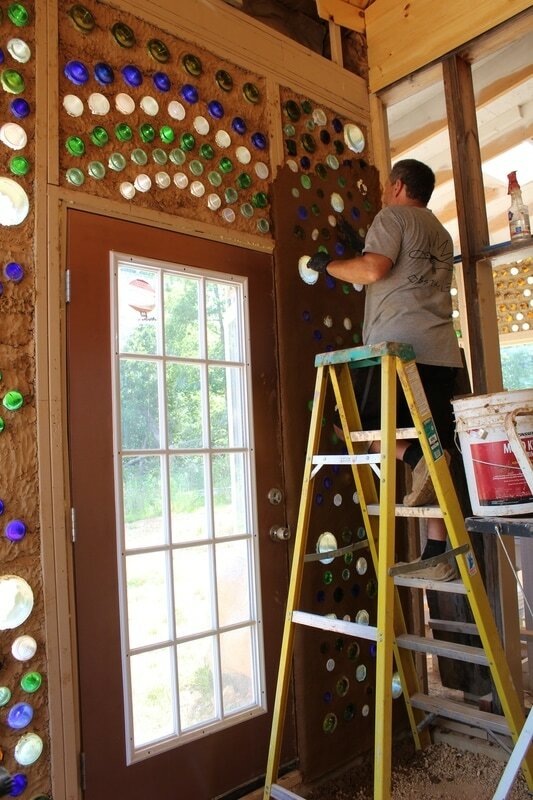 It has been a challenge to build a Earthship styled home here in Missouri. We are still moving forward and are going to persevere. 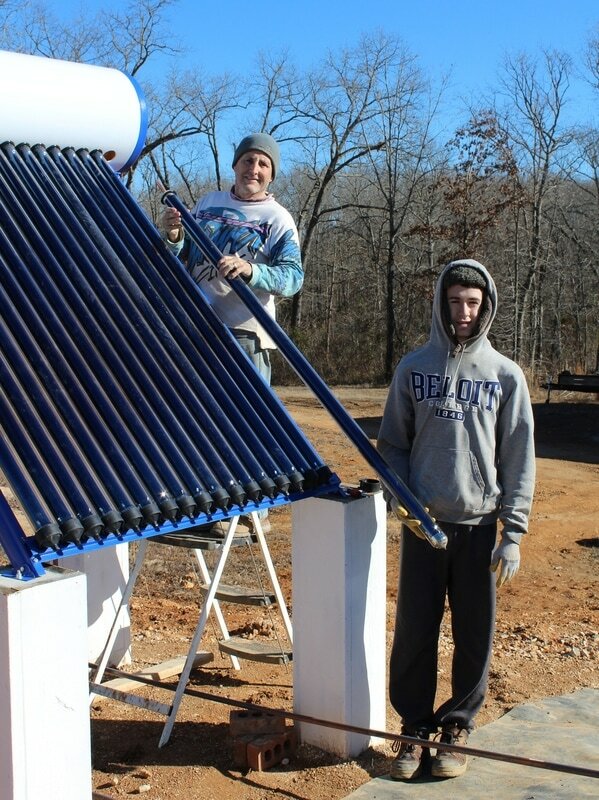 Allen and Arron have finished putting together the Solar Hot water heater. 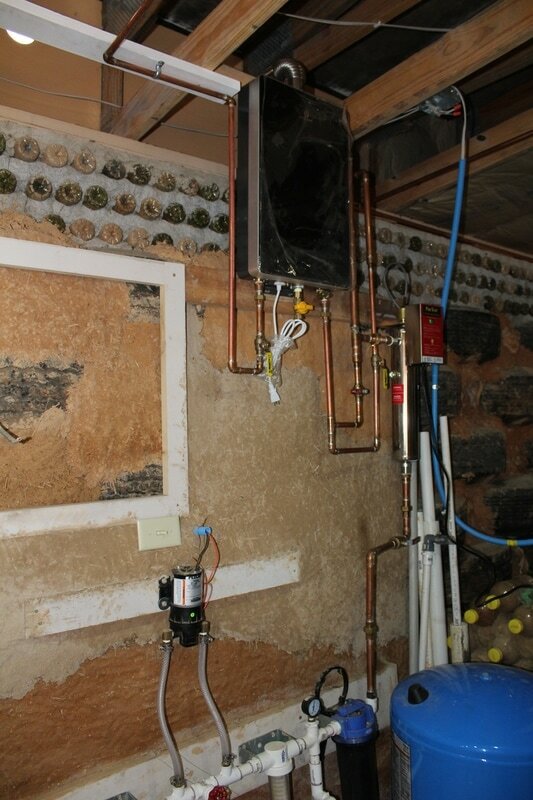 Allen has most of the cold and hot water copper pipping in the Upcycled home in place. 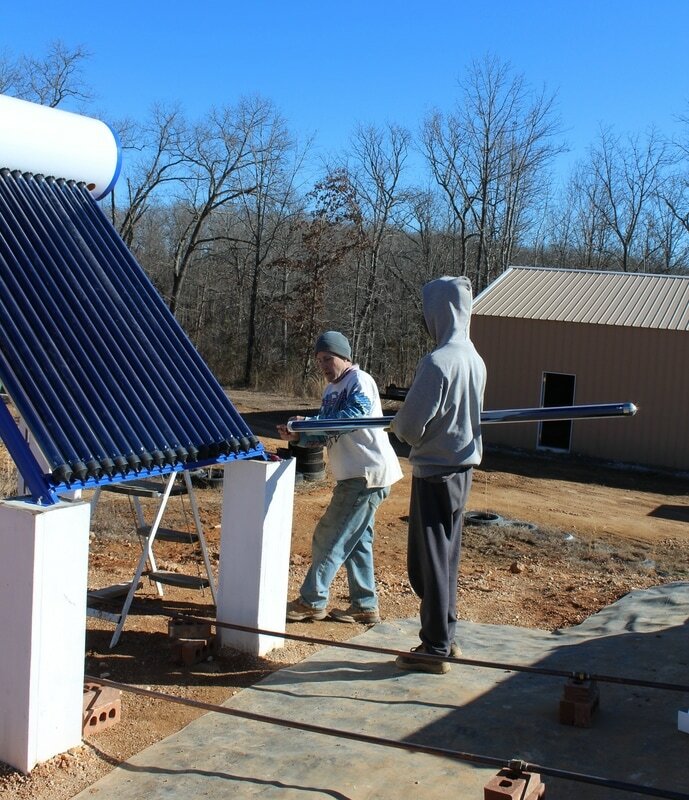 Installing the solar tubing was the last part of the solar hot water system. Above Arron is hanging on to the solar glass tube while Allen is putting on a rubber grommet. In the photo below you can see a copper rod come out of the glass tube. You might wonder how in the world does this system work? The glass vacuum tubes act very much like a solar panel. Instead of generating power these tubes generate heat. The heat from the sun travels up the tube through the copper rod into the tank above. The tank is what is holding 40 gallons of water. That heat is released into the cold tank of water. After a few hours the water is hot. The tank is insulated so once hot it will stay hot for a while. We don't know how long the tank will stay hot for after the sun goes down yet. This system does not have water going into the tubes. The glass is specially designed to absorb the heat. If any one the the vacuum tubes would ever happen to break the system will still work without it. This is one reason why we choose this system over others. 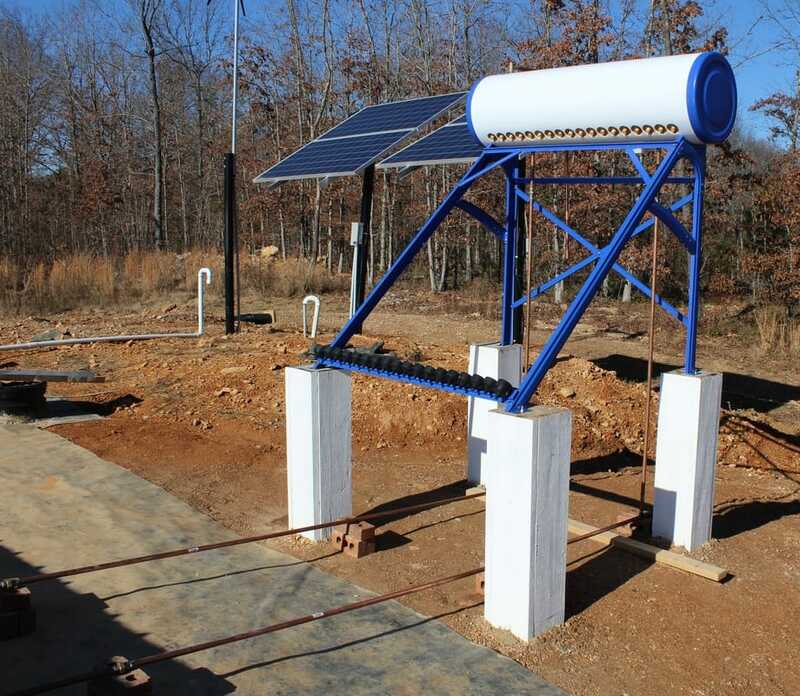 The next step we need to do outside with this solar hot water system is to insulate the copper piping coming out to the solar hot water heater and then back into the home. When we have a really good stretch of no rain we will be applying papercrete to those pipes. The shower hot and cold pipes are up and ready. We wish the rest of the shower was. The pipes to the bathroom sink are in and then turn to go through the wall for the kitchen sink. This is in our back hallway. We have hot and cold pipes that will first go to a washing machine when we are ready to have one. Then pipes go to the double wash tub. At the moment we don't have the drain line that go out to the greenhouse planters hooked up yet because the planters are not ready yet. When we turn on the water that goes to the sink we have a 5 gallon bucket underneath to catch any water when we are not paying attention. Now at the beginning of this article I mentioned that we have hot water. Well what I should of said is that we have scalding hot water. One evening I had wanted to just wash my hair so I came out to the wash tub to do this and try out our solar hot water system. It was at 6:00pm and at that time the sun was going down. I didn't think that the water would be too hot. Well it was. I had to jump on the cold water because it can get scalding hot if your not careful. I will say that the solar hot water heater works quite well. On a side note. 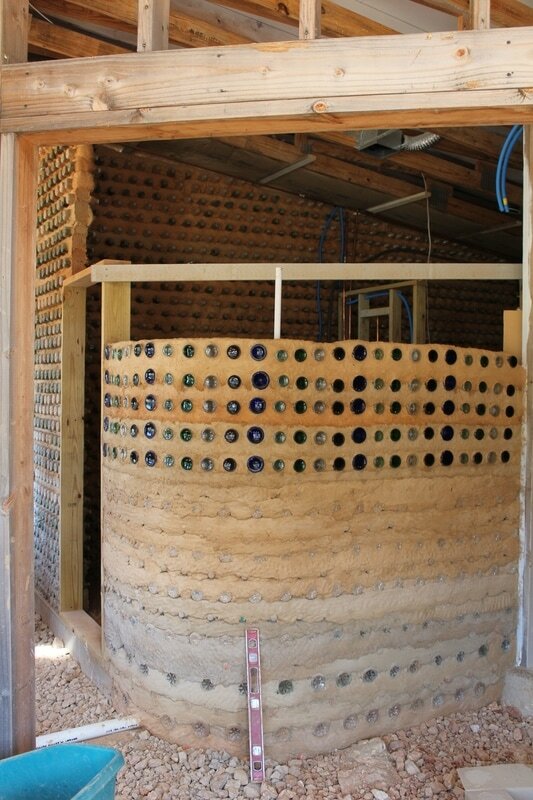 Earthships are set up to reuse the grey water before it goes out to the septic system. 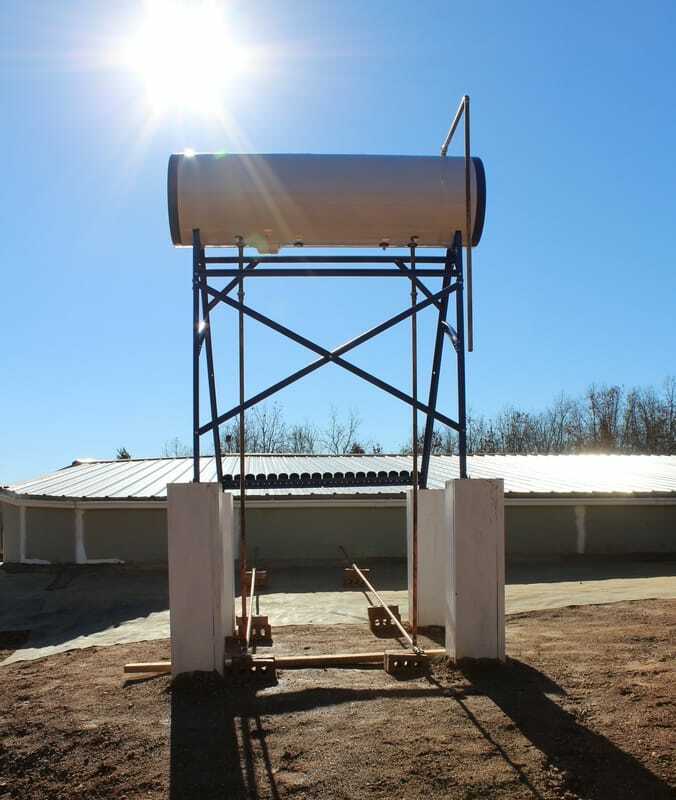 The water that is used will go out to the greenhouse and get filtered by the plants that are growing in them before the water is then used for the toilet. The black water is the only water that goes out to the septic system. With that said, the planters need to be up and running before the bathroom can be fully functional. This will need to get done this year. 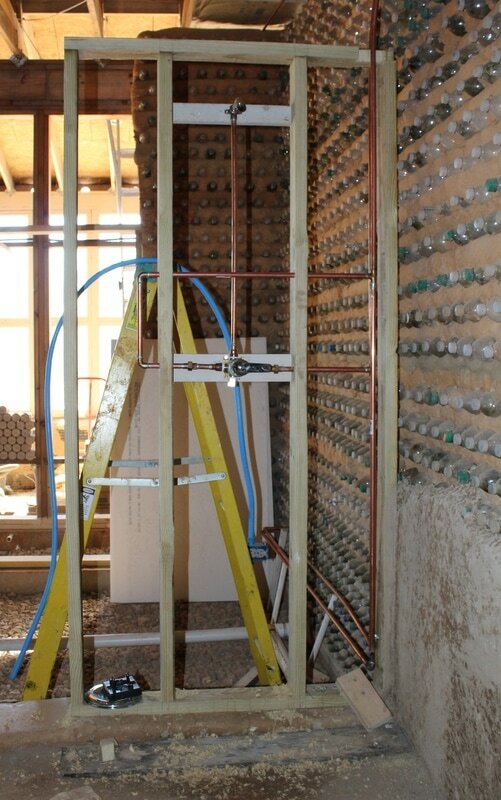 The hot and cold water pipes within the Upcycled Home. The photo below shows the lines coming in from the solar hot water system that goes into the black on demand hot water system. The on demand is not operating yet. Allen is currently working on the piping for the propane gas line. Once this is done the on demand will be working. When it came to new windows we had to make a decision. Do we go with the double pane windows or single pane windows? Michael Reynolds has stated in his older books to use double pane windows. So we debated and did some research. We know from our experience that over time the double pane windows leak. 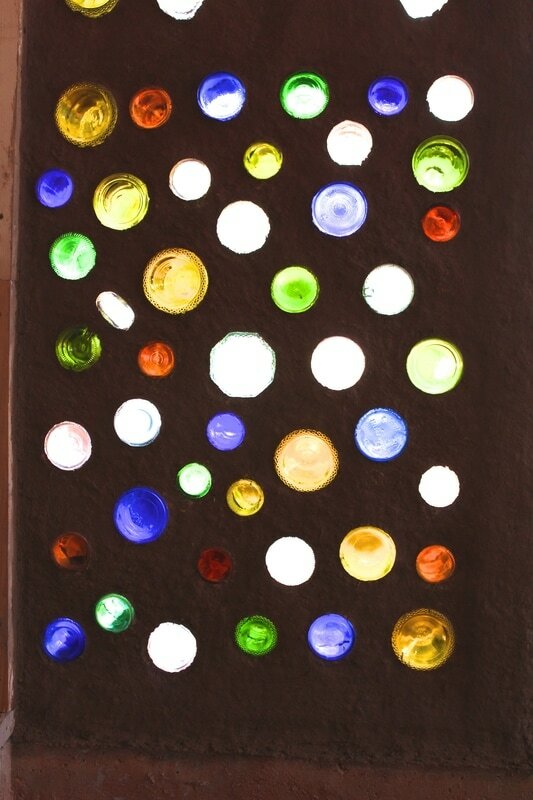 This is what has happened to our double pane reclaimed glass that we had used to enclose our Upcycled home. They came from old Coke coolers and we saved over 66 Coke cooler doors from going into the landfill. We thought we had it made until the moisture was seen in the windows. Then it came to me to check to see what big greenhouses use for windows. 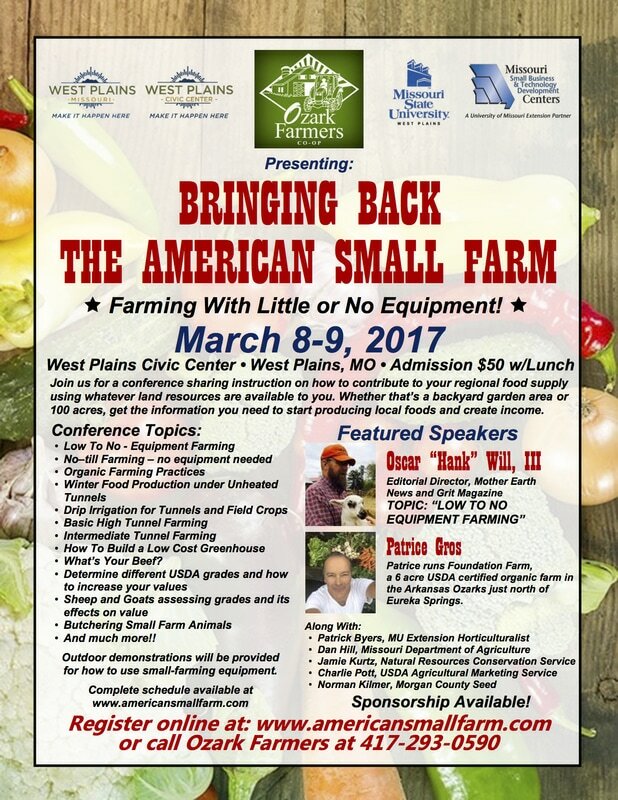 I came across an article from the Green Home Gnome ( link to article found below). I found out that glass is the best material to use. We would agree since the greenhouse is attached to the front of our home, we would like to see out our windows. The article stated that if you put double paned windows in a greenhouse that it will void the warranty. It is because of the added humidity and heat that is in a greenhouse as to why the window manufactures will not honor the warranty. The conditions of the greenhouse will degrade the double pane windows faster. When we were window shopping I asked a company that we were getting estimates from if it would void the warranty or not. We did learn that it would shorten the warranty of the windows from the manufacture. 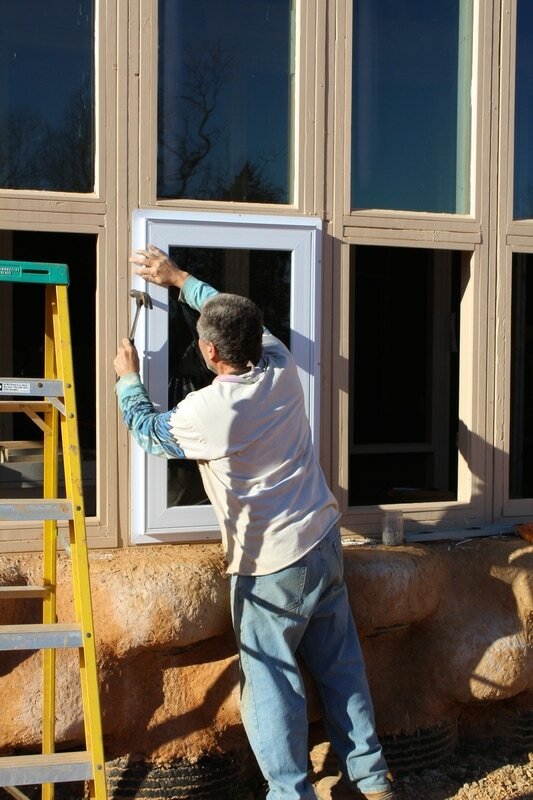 We have read numerous places that double pane windows can start to leak in 10 years. Because our greenhouse we could be changing them out a lot sooner than 10 years. That is a lot of work and money going down the drain. To us this was not worth it to slow down the heat loss from the Upcycled Home. Another thing to consider is that any windows with a Low E coating will not allow the heat from the sun to come in to the home. This heat is reflected back outside. This is perfect for homes having to run a air conditioner in the summer time. Less heat in means better savings. This is not so for those homes designed for passive solar heat for the winter time. 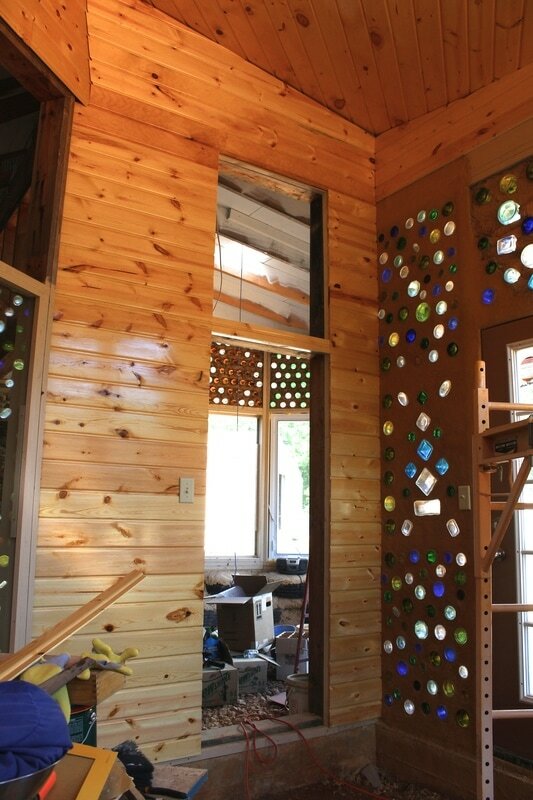 Our Earthship styled home is designed to face south to allow the sun to come through during the winter time. The thermal mass that is in the tires, walls and floors absorb this heat and when the home cools down releases this heat back into the home. If we have windows with a Low E coating on them there will be no heat coming into the Upcycled Home for the thermal mass to absorb. This is a problem when your main source of heat is the sun. The windows we got for free have a Low E coating on them. No heat was coming through. 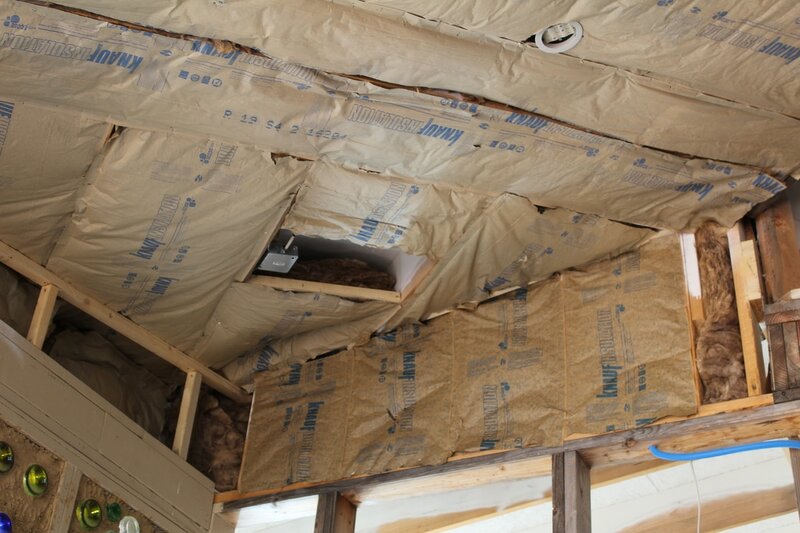 We didn't realize this until on a warm 70 degree winter day the Upcycled Home was colder inside than it was outside we knew we had a problem. We had to change out these windows sooner than we had wanted to. This takes away time that would be used to get us into the earthship by winter. 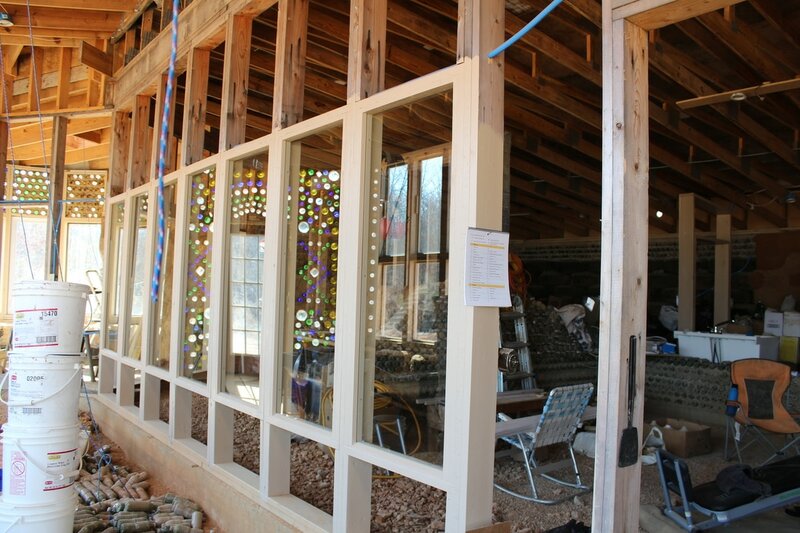 After doing all the research that we had done we decided to install single pane windows. We were able to find single pane casement windows and 1/4 inch tempered glass through A & A windows in West Plains for a really good price. 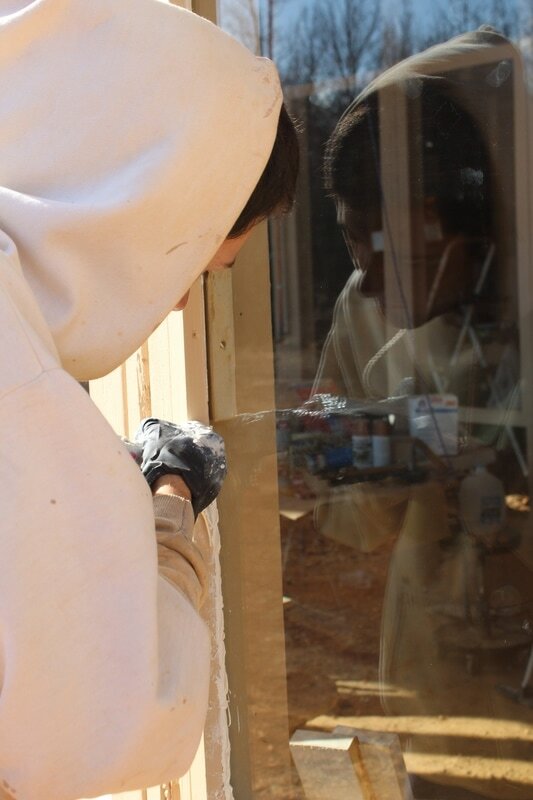 Arron putting in the window glaze. This seals the window to keep out the moisture. Allen is smoothing out the glaze. Window glaze leaves a nice finish and it can be painted. It does however take about 30 minutes to glaze one window. We were surprised as to how much the casement windows let in a lot of air. It is nice to catch that breeze on a nice spring day. 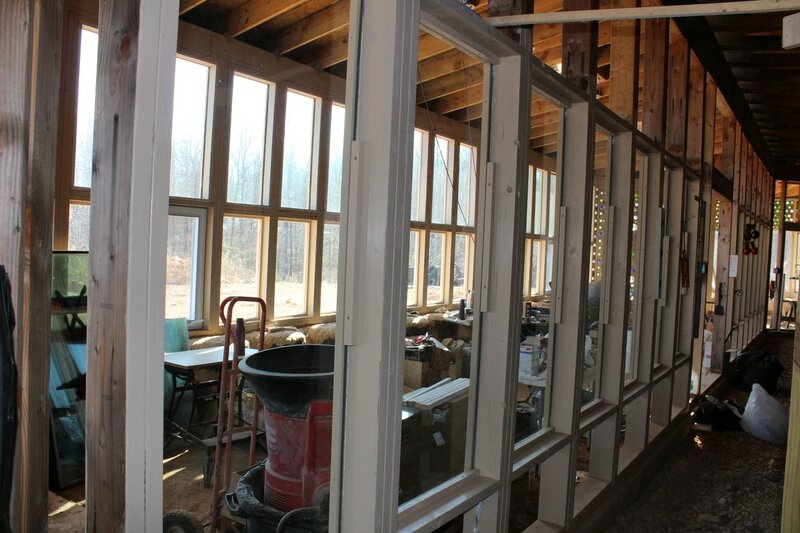 The east and west sunrooms have all the new casements and stationary windows in place. The green house has the bottom row of new windows in place. We have the top row to complete along with the glazing of them. 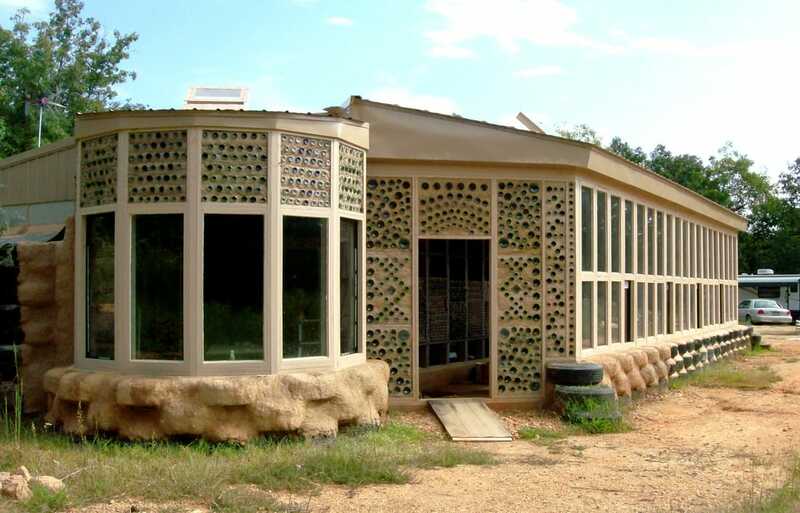 Most Earthships now use, what Michael Reynolds terms as a double green house. What this means is there are the exterior windows of the greenhouse and a interior set of windows on the other side of the greenhouse creating a double glass or greenhouse effect. 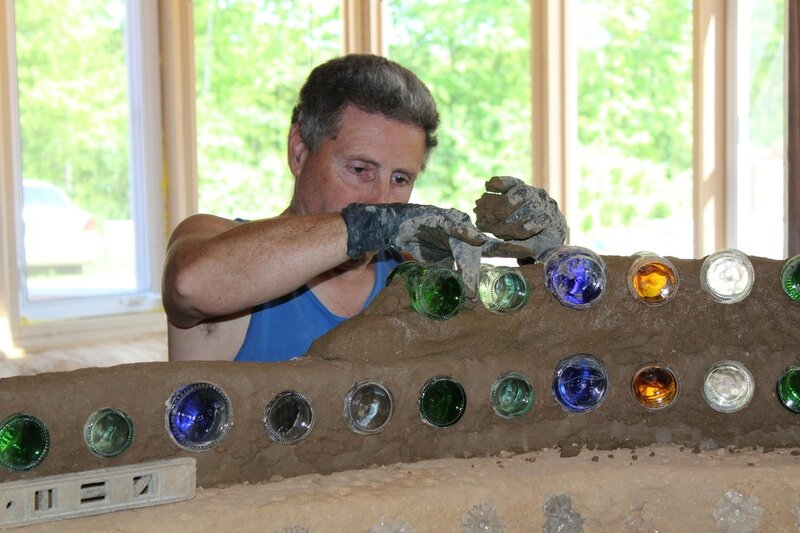 Through the 45+ years that Michael Reynolds been designing earthships they have changed to include another set of glass windows on the inside of the earthship to increase the amount of heat that the thermal mass tires, walls and floors to absorb. 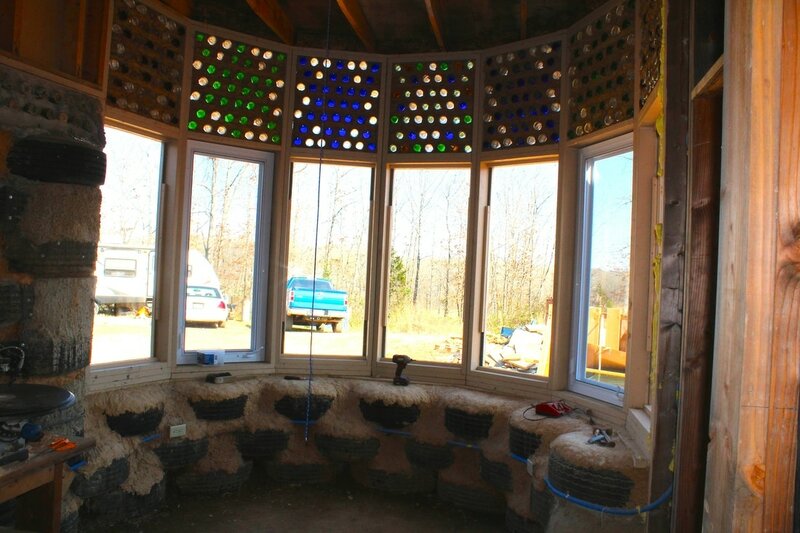 Michael claims that the more layers of windows you put in the more heat that will come into the earthship. We are putting in a double greenhouse for the main part of earthship. Our bedrooms will actually add another layer of glass to it. 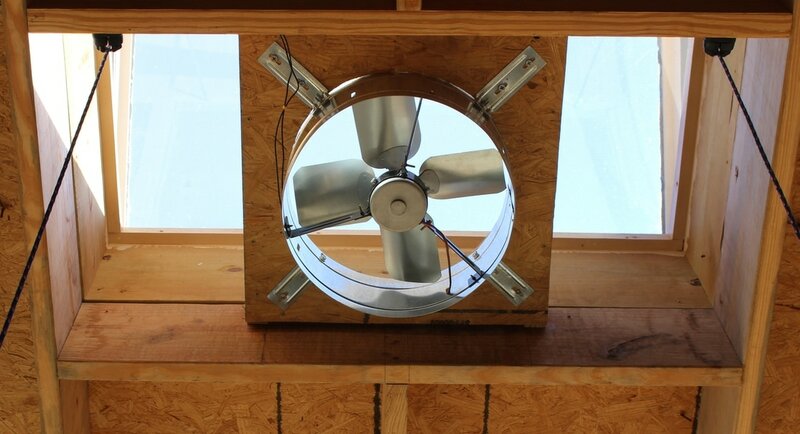 So we will see if this will help us to get more heat to the back of the earthship. 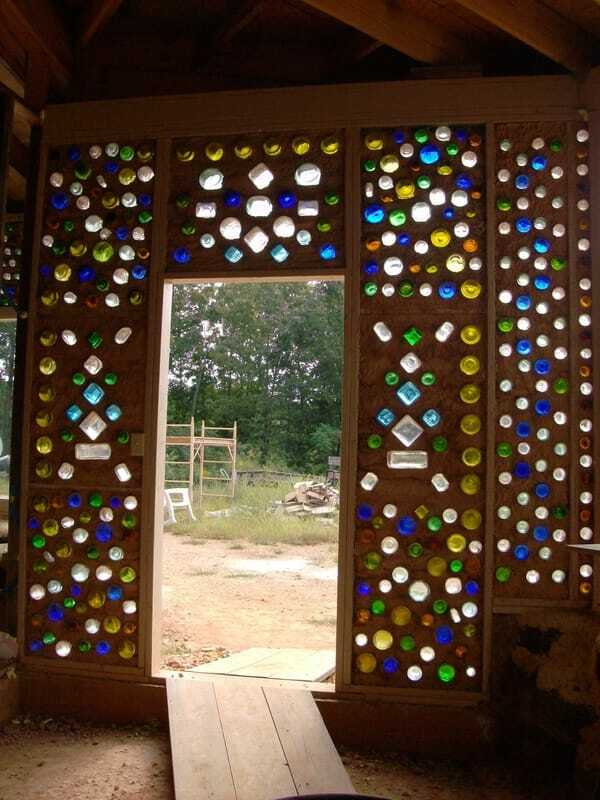 We built our earthship deeper then what is normally being built now. 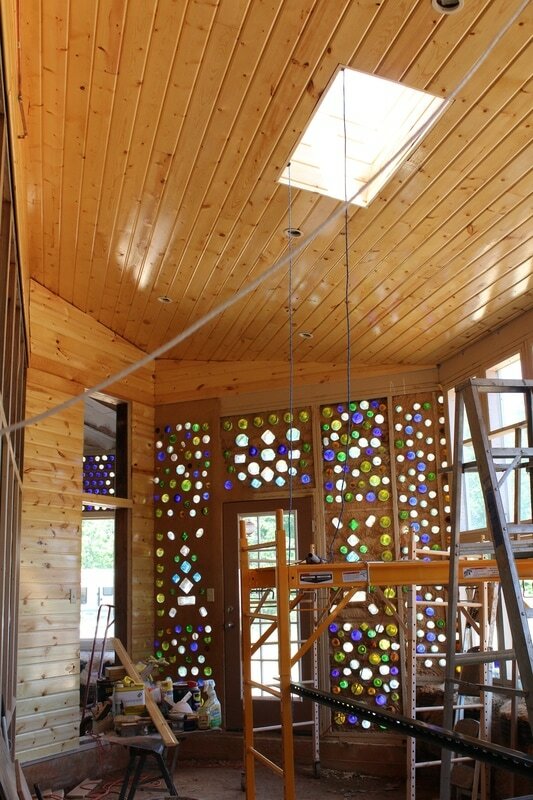 We call our Earthship a Hybrid. It is a combination of the old, new and Severin styled. Now that we have more windows installed without the Low E coating on them we are starting to notice a difference in temperatures within the Upcycled Home. In the photos above and below you can see the reflection of the greenhouse in the windows. Otherwise it is hard to see them. Thank's For Reading My Blog. There have been many times when I have gone up town and seen someone that looks different. We catch them out of the corner of our eye and we take a glance at them to see why they do look different. These people know when they are being looked at. At times I would think to myself," I can't imagine what they must be going through." Those people don't want to be looked at they want to be accepted for who they are. Society is not used to seeing people that look different so they don't know how to react to them. This used to be my perception of society. Now I have realized and experienced that it isn't necessarily so. It is more of a fear within one's self. In case you haven't caught on yet this article is not about the Upcycled Home it is about a family member going through struggles of her own. And because of this has come to a better understanding. Struggles, we all have them. Some are invisible others are visible and stand out from the crowd. Struggles can weaken you or they can strengthen you. It is all a matter of how you look at it. My struggle goes way back to my early childhood. Not many people are wanting to talk about childhood abuse and I am one of them. Going through it can lead to denial and then it gets blocked and ignored and thrown in the mental closet. You don't think about it and you do all you can do to forget it. Until the energy gets to hard to bear anymore and must come out. The body alway's remembers and knows exactly what happened. You can only ignore it for so long before the body will make it known to you if you refuse to acknowledge it. Now as an middle aged adult all of that stored energy is coming up and out and it is time that I accept it and release it. Why am I talking about it? I must admit that I didn't want anyone to know about it. I didn't want people to look at me differently. It was a stain that I couldn't wash away. Society doesn't want people to talk about it. They want everyone to push it in the back mental closet and pretend that it didn't happen. Society don't want this darkness to be known and acknowledged. I will say the only way to let this go is to open that dang closet door and go through it and clean it all out. Otherwise sooner or later that closet door is going to bust open. I believe the more the light shines on this darkness perhaps we can make a difference and help someone else break free as well. I have been cleaning all the darkness out that has been stored in the closet all of these years. Now because of how I have held on to this so tightly it created a health issue for myself. My body is out of balance and doesn't look normal. I have a large growth in my breast and because of this it has slowed me down from working on the Upcycled Home. Which is very frustrating at times for me. We are a person down and I want so much to help build my home but my body needs attention and care. Some day's I feel good and get some work done. I feel blessed on those day's. I have a shirt that say's "Mind over Matter." Most of the time it is a mind game for me. I am more super conscious than before of myself and others around me. I don't really want to go out in public. What if someone notices? Will I be accepted? Will I feel their stares? With my energy so low at times it is exhausting to be able to do the grocery shopping. So Allen has been doing all of the shopping and washing all of our clothes at the laundry matt. I was ashamed of what I looked like and wasn't ready to handle other people's reactions. You get to a point where you don't want to hide anymore. You want to live your life. The only person that I needed to have acceptance of is myself. I have needed to love myself no matter what I look like. Who cares about what others think. The most important person is me. What ever your struggles are don't ignore the most important person and that is you. Look at yourself and see you for who you really are. The light that you are. Jesus has been a big part of my healing and my releasing from the darkness. He has been the Master Healer and the Master Teacher throughout. Leading me every step of the way. The other day while working on the Earthship the thought of asking for prayers came in. Well this would have to mean that I would have to get this out and let people know about the health issue that I have been going through. I wasn't sure that I had wanted to go there at all. I had wanted to heal without anyone noticing my condition. Because I didn't want to have to deal with other people's negativity about it. I didn't want to go there. I have learned that Jesus will not give you anything that you can't handle even though in that moment you believe that you can't. Believing is the key. It is the key to resolving issues it is the key to heal. Believe that you can even though every ounce of your body is telling you otherwise. It is taking that leap of faith towards that belief. Sometimes all that we need is to know that Jesus believes in you and that you can move forward. Believing in him helps you to take that step. I want you to understand that this has been my understanding. I don't mean to preach here at all. And if you don't agree with me, that is alright. I love you anyways. So I took the advise and called my mom, and my sister to let them know what I have been going through. I asked for their prayer's. What I have been ignoring has in fact been very healing for me. I had the best talks with my mom and sister than I have ever had. My close friends have been accepting of me as well. So far I have not had the negativity that I had expected to get. They were understanding to what I was going through. Working through our worst fears in life are the keys to healing. I have written this article to ask the readers of this blog if you find it in your heart to pray for men your prayers would be greatly appreciated. 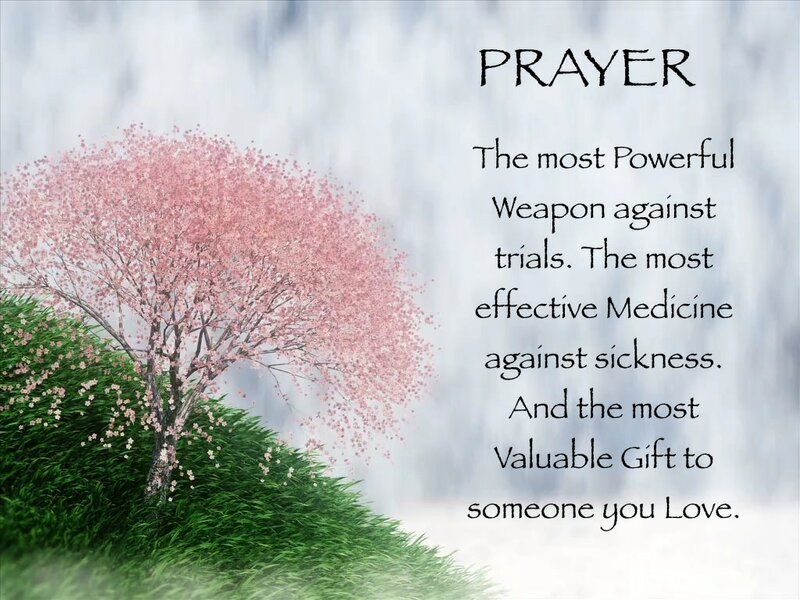 Prayer is a powerful tool. The only way to connect to it is to let others know that you are in need of prayers. My hope right now after reading this article is that you have a greater understanding of me and others for when they are in trouble and in need. And to take a moment for yourself from time to time. Sit in a quite place and ask yourself, How are you doing? Be still and see what comes up. And if something does don't ignore yourself. Be brave enough to do something about it. The Severin's need some help in designing a Logo. We would like to harness the artistic talents of our followers to incorporate a design that the Severin's would be proud to put on business cards, T-Shirts, etc. If you have what it takes to create a Logo the Severin's would like to see what you would come up with. A 2 hr. private tour of the Finished Upcycled Home for you and your family. A set of 4 handmade glasses upcycled from wine bottles and a T-Shirt with your design on it. Along with proper design credits. No limit as to how many designs you can turn in. The Severin's have the right to make changes to or add to the logo that is chosen as the winner. 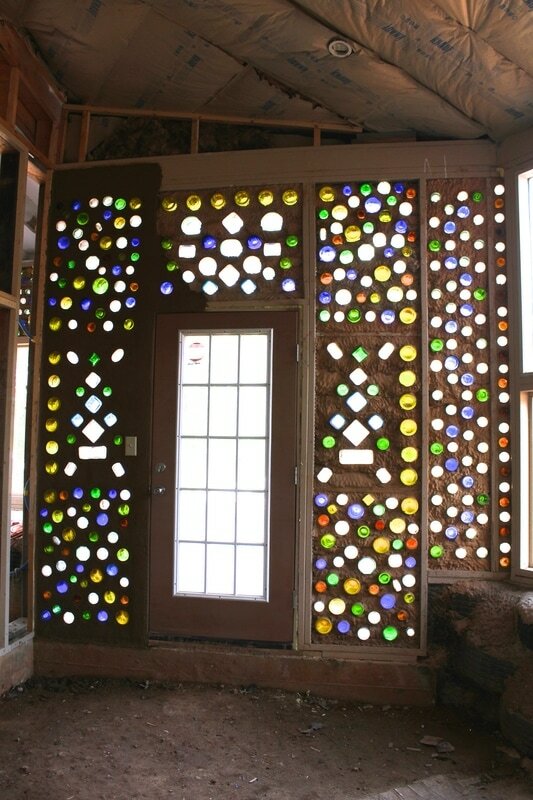 The design must incorporate what the Upcycled home is about. 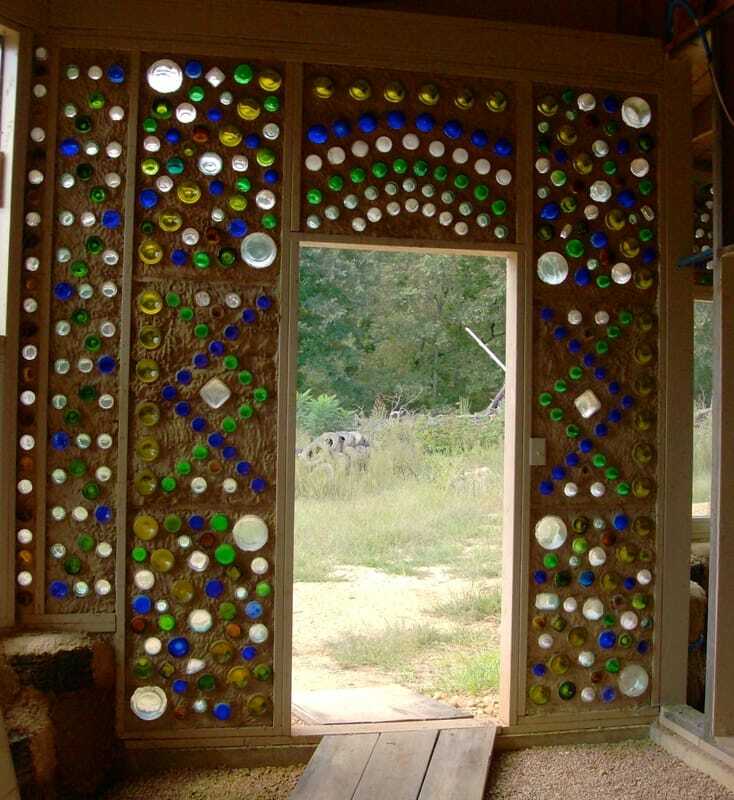 Using any one of the 6 Earthship Principles - Go to the link Earthship Principles for more information. If none of the designs are approved for use by the Severin's then no winner will be chosen. If you have any questions on any kind feel free to call or send us an email. We have had a mild winter this year. When living in a camper that is the best kind of winter to have. Plus is does make it a little easier to get out and work on the Upcycled home. Allen did a great job painting the entry doors. They are painted with a hammered copper spay paint that we got at Walmart. The doors themselves came from Ozark Salvage in Koshkonong, MO. We paid $139.00 for each door. 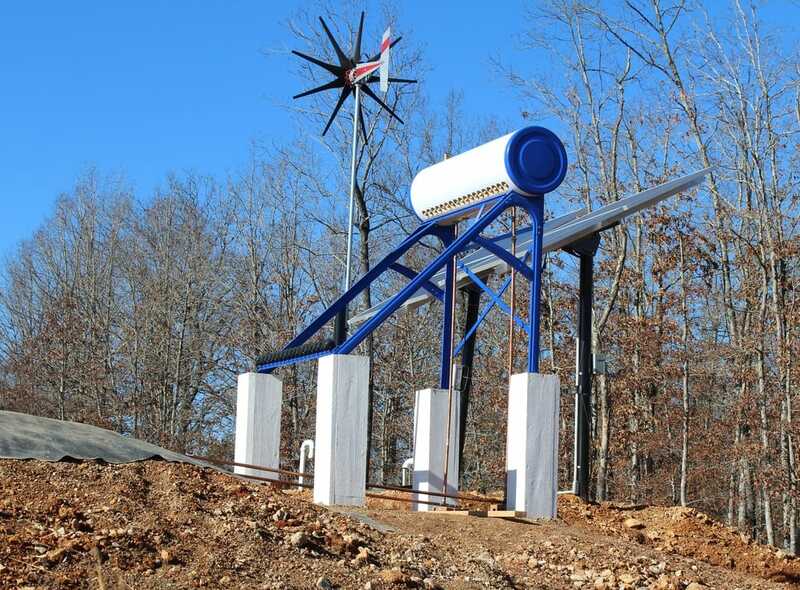 Ozark Salvage is a great place to get new building materials at great prices. As long as you don't mind looking through everything and don't have your heart set on a certain kind of product. They are a place that sells second hand products or products that were damaged. We bought all of our doors through them. 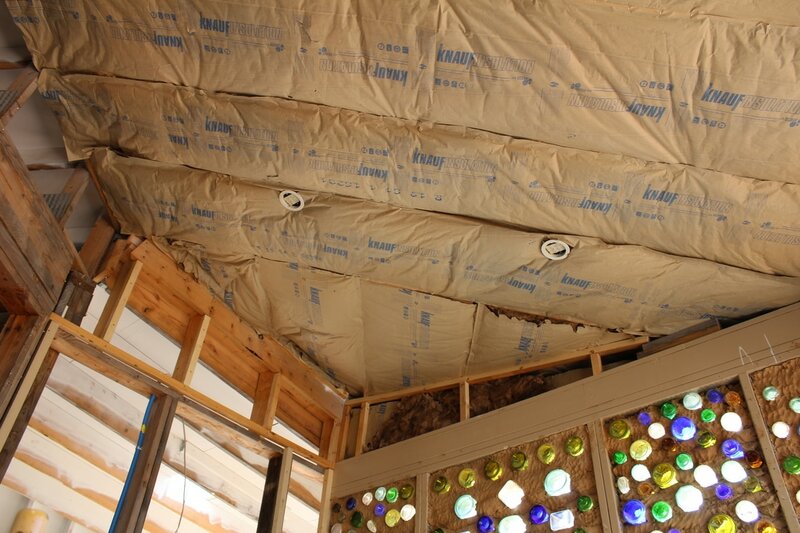 For January and February we are focused on doing projects in the Upcycled home that has nothing to do with moisture. Now that we are fully enclosed with the doors on. Our moisture levels went through the roof. Why did our moisture levels get so high? 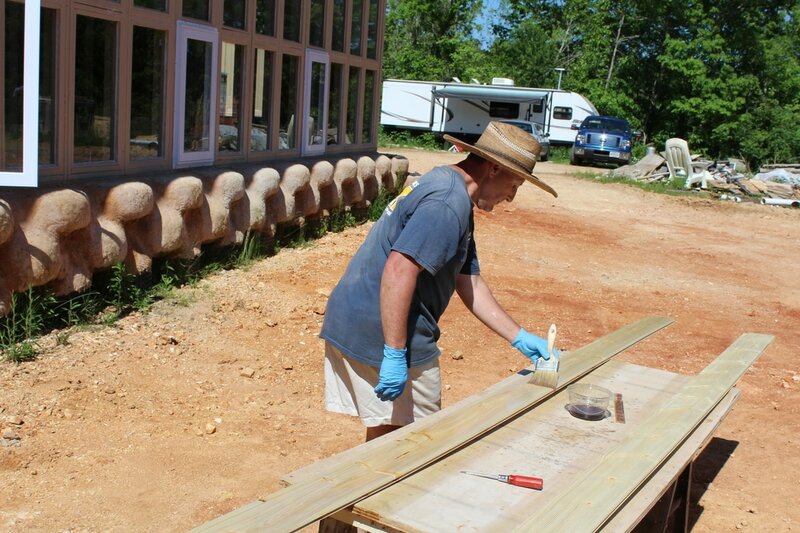 When building a Earthship style house you are constantly putting in moisture into almost everything. 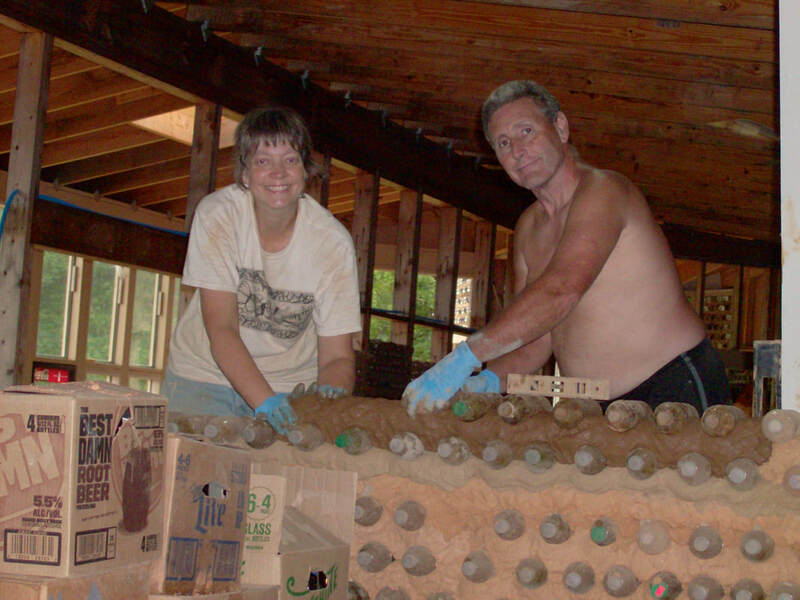 All of the walls are built with earthen cement and mud plaster, we have applied papercrete to the outside walls on the inside, there is moisture in the dirt that we sift and store in the earthship. This all takes a while for things to dry out. Even when you physically feel the wall that you built and it feels dry to the touch and is hard does not mean it is totally dried out. 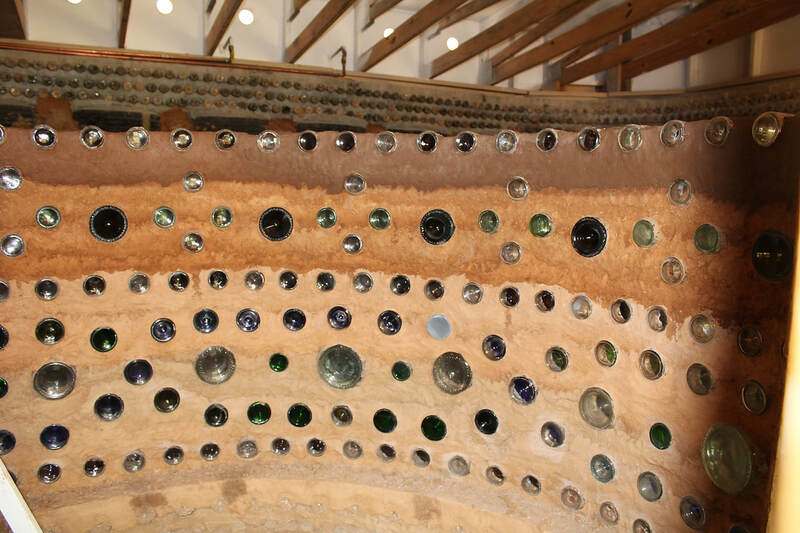 We have been told from other earthship homeowners that it can take 1 to 2 years to fully dry everything out in the earthship. We didn't realize how true that is. There are a few things that can get ride of moisture. A dehumidifier can. Being on solar power and with the size of the home we didn't feel this was an option. A Dehumidifier can use up a lot of juice to run. Installing some kind of wood stove will remove the humidity in the home. We have plans on installing a Rocket Mass Heater this year. We are currently getting the floor ready for the RMS and have already bought the firebrick for it. 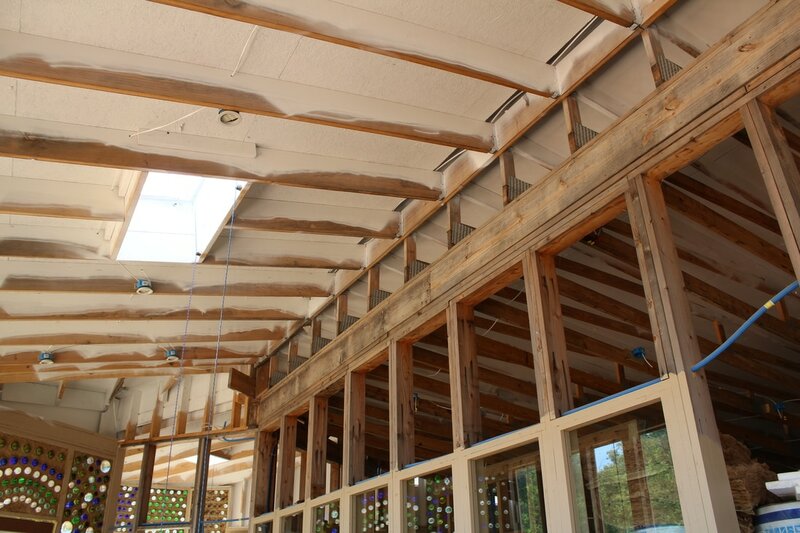 We have a different kind of roof system than what Earthship uses and because of this we needed to put vents in. This has helped bring down the moisture since we do not have a ceiling in yet. We didn't want to put vents through the roof. The less going through the roof the better. The photo above will help with moving air within the greenhouse roofing system. 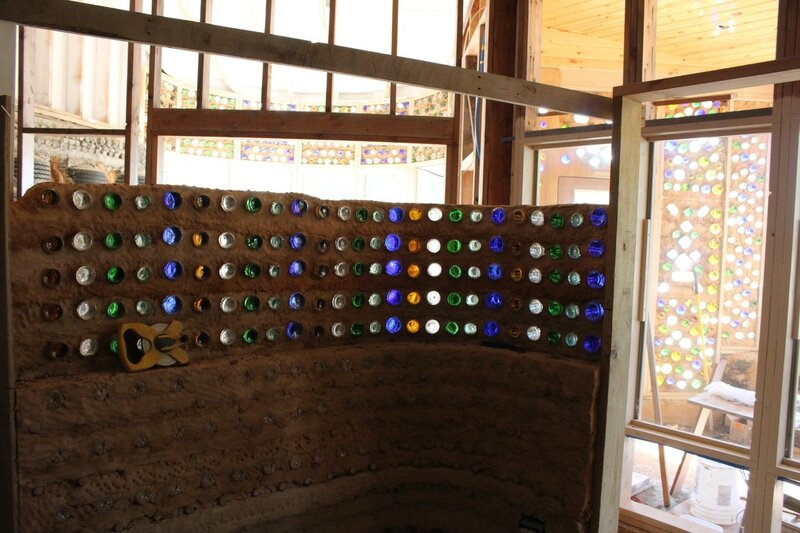 We have installed large vents on both the east and west sides of the earthship. This will give the Upcycled home cross ventilation between the rafters. 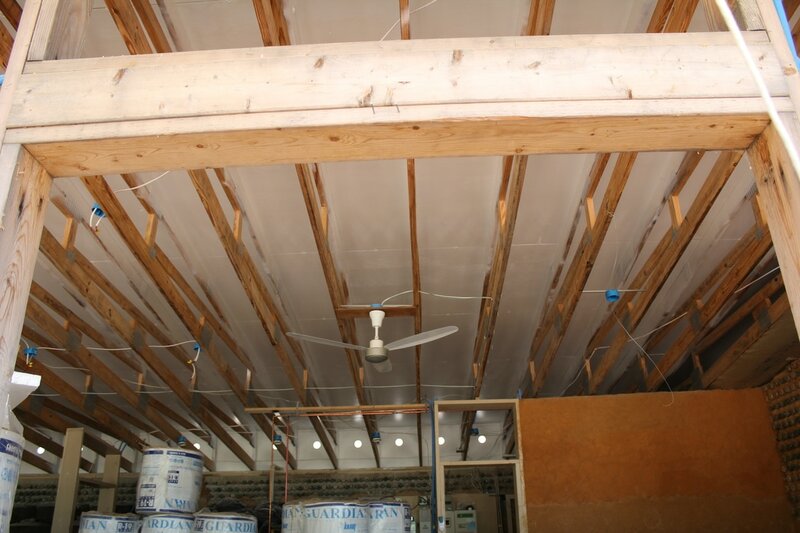 Since we used flooring trusses for our roof there are gaps within the rafters that will allow air movement above the insulation. These are vents install in the back of the Upcycled home. These vents are placed in-between the rafters and will give air flow up to the green house roof. When we installed our roof we did put in a ridge vent so the attic area would have ventilation. This is the second home that we have built our first home we had that mesh at the peak for air flow. Down the road we had to install two other vents because just that mesh was not enough. This is why we made sure this time that we were going to have enough of a air flow within our attic. 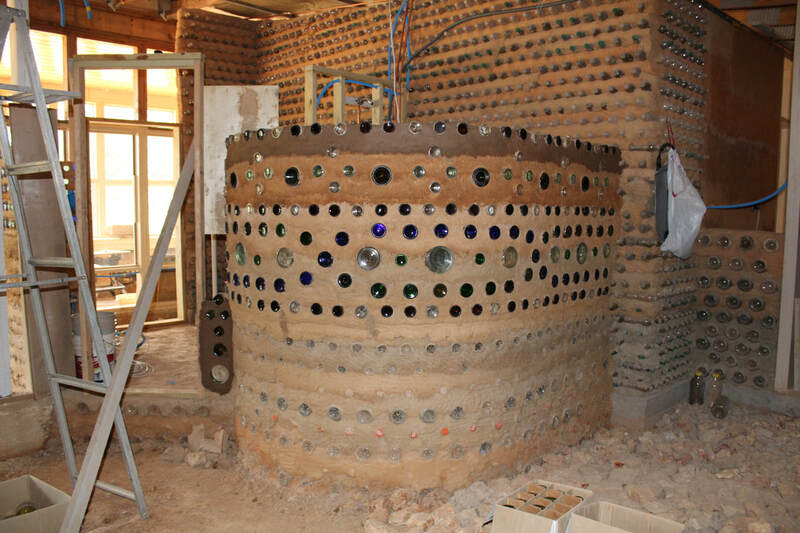 Earthship Biotecture developed by Michael Reynolds to our knowledge does not install greenhouse exhaust fans. 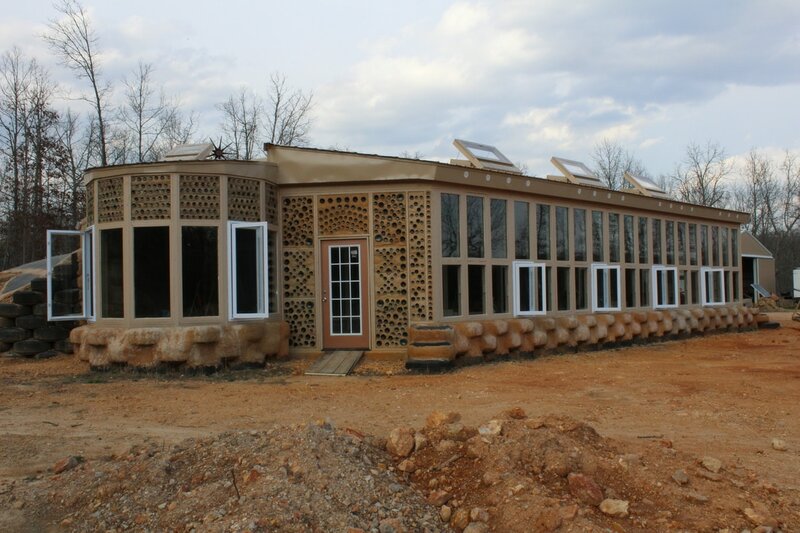 When we had a facebook page the main concern about building an earthship is the humidity issue. 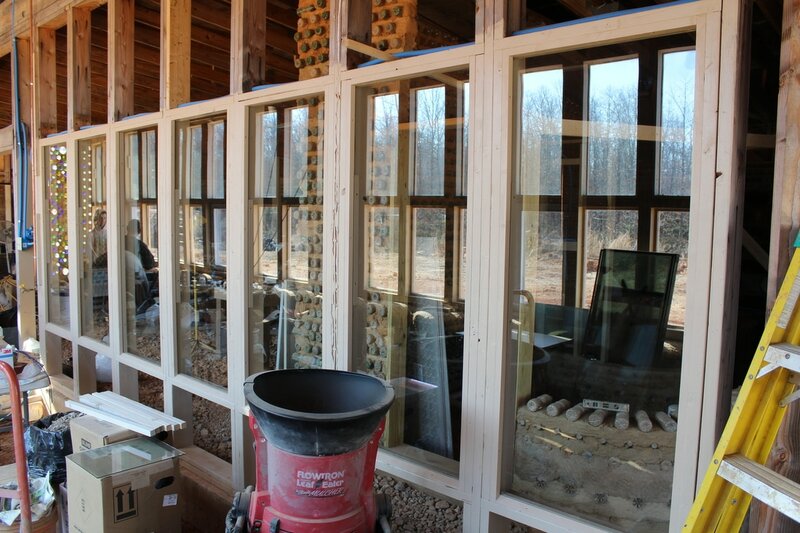 All earthship owners were constantly discussing the need for ventilation and getting out the humidity within the greenhouse. When I had mentioned putting in a exhaust fan. There wasn't a lot of excitement for it. I don't know why. 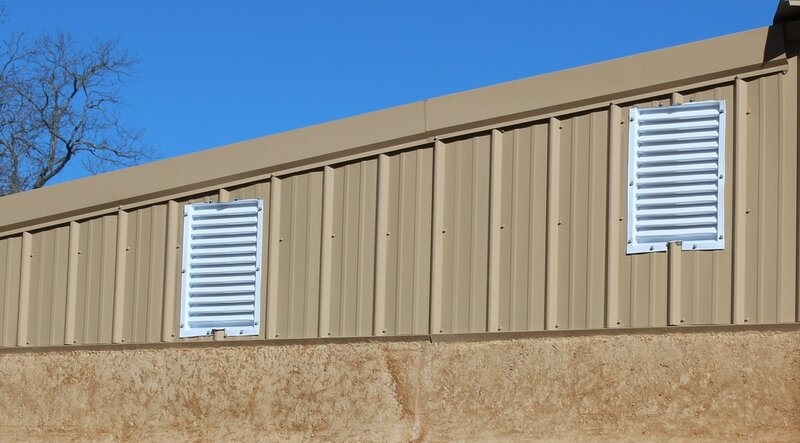 It would help vent out moisture, help with air flow, and remove excess heat during the summer time. We bought this exhaust fan from Sam's Club Online. We paid $158.00 for it. This was worth getting the Sam's Club Membership because we saved $100.00 on this fan compared to other places. Allen connected this fan to a switch. To use this fan all we need to do is open the skylight and flip the switch. The switch on the left if for the exhaust fan the other is a 3 way for our green house lights. This exhaust fan did not come with a switch. Allen used some innovation skills to make it work on a switch. This fan is powered by it's own solar panel. It is another item that does not draw power from the solar system. 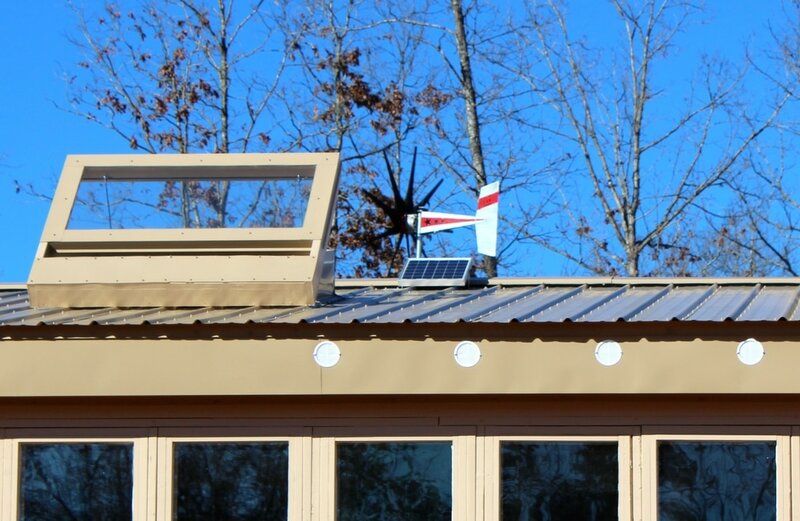 The little square panel at the peak of the roof is the solar panel for the exhaust fan. So far we are very please with this fan. It is very quite. Even in full sun when it is running at higher speeds it is relatively quite. This should vent out a 1500 square foot area. Our greenhouse is not 1500 square feet so some of the earthship will get vented out also. Even on cloudy days it will operate at slower speeds. With the vents and the exhaust fan in place the humidity levels are coming down. After the rocket mass heater is built we can fire it up when the temps are cooler to help dry things out in the earthship. This we feel is important to have. 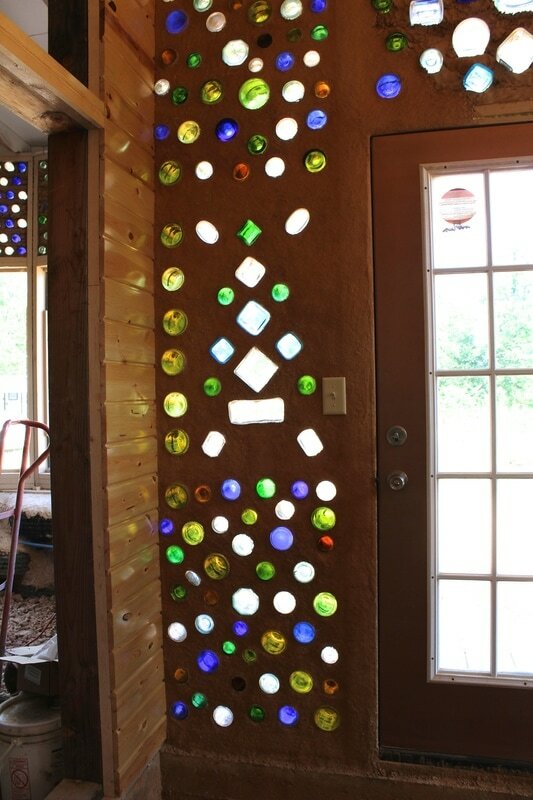 You have to have some way of venting or drying out the moisture that you put into your home when you are building a earthship kind of home. Mold and mildew is not a good thing to have in a home. We are alway's working on the floors. Arron is our Sifter Expert at the moment. Every time we sift dirt from onsite we get loads of rock. So we put them into the floors right away. At times it can be a bit awkward walking on different sizes of rock but it is only temporary. It made no sense dumping huge piles of rock outside when we knew we would be bringing them in again for the floor. 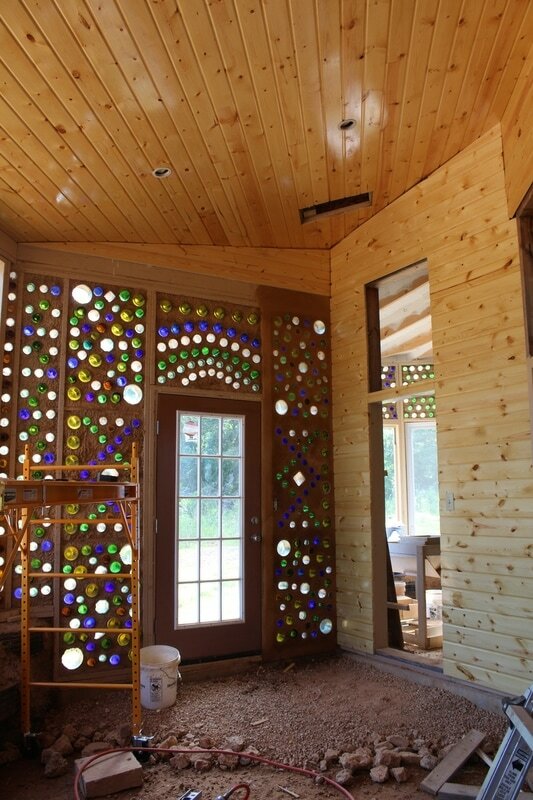 This is Upcycled Home is labor intensive as it is. We start with bigger size rock that are between 3 to 5 inches thick depending how low the floor is. Then we add medium size rock that is between 1/2 to 2 inches or so. This size rock fills in a lot of the gaps between the larger size rock. The photo above is our bathroom with the medium size rock in place. It is much easier to walk on this size of rock. This is the shower floor that already has the large, medium and small rock laid down with a layer of sifted dirt on top of it. The sifted dirt has been leveled. Next Allen will add more sifted dirt to certain areas so the water will move towards the drain. We will install a cement board over this and then put down a layer of tile that we got from Habitat for Humanity Restores. 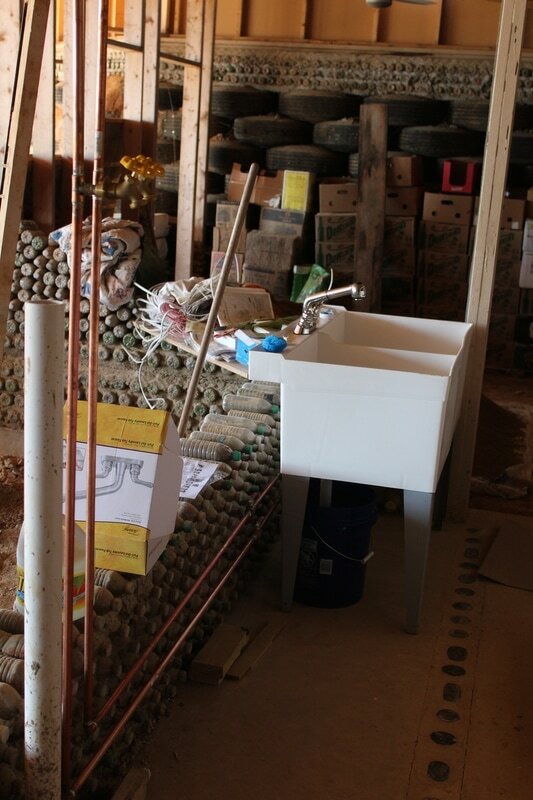 Allen is currently working on the hot and cold water system. He is also working on running the gas lines and connecting them to the on demand hot water heater. Arron continues to sift dirt and Mary places the buckets of rock in place for the floors. We will be focusing on the west and east sunroom and living room for the floors. We have been doing a lot of researching on windows. The doubled pane reclaimed glass that we used are now leaking. They will need to be replaced. We have learned that windows with Low E coatings on them will reflect the heat back outside. 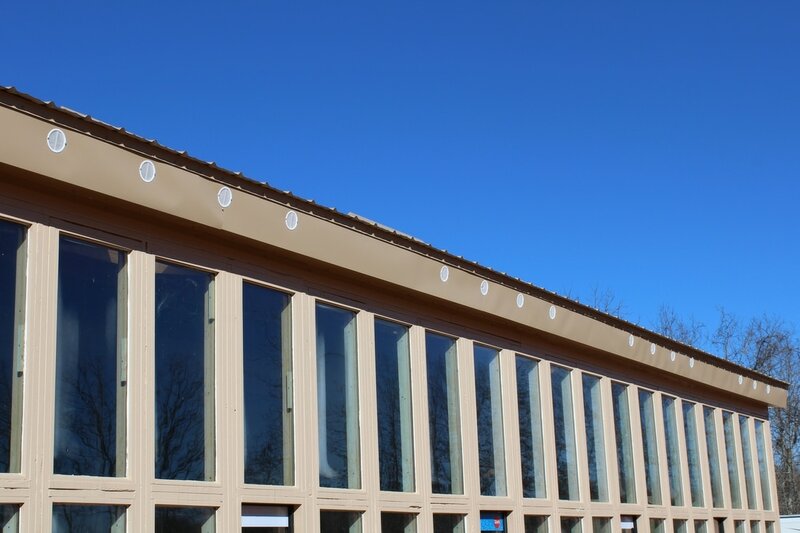 When you are building a passive solar home that needs that heat it isn't a good thing to have Low E coatings on your windows. We believe that the reclaimed glass has a Low E coating on them. How do we know? We have had some 70 degree temps this winter. Which is awesome to have. The only problem the earthship did not heat up. It was cold in the earthship. Even though we have had some single digit temps this winter and the earthship did stay at 40 degrees, we now believe this was from the dirt around the earthship preventing the cold from coming into the earthship. Not from thermal mass. Sometimes it takes more prep work in order to get anything done. Even though we keep telling ourselves each thing we do gets us closer to getting something finished. 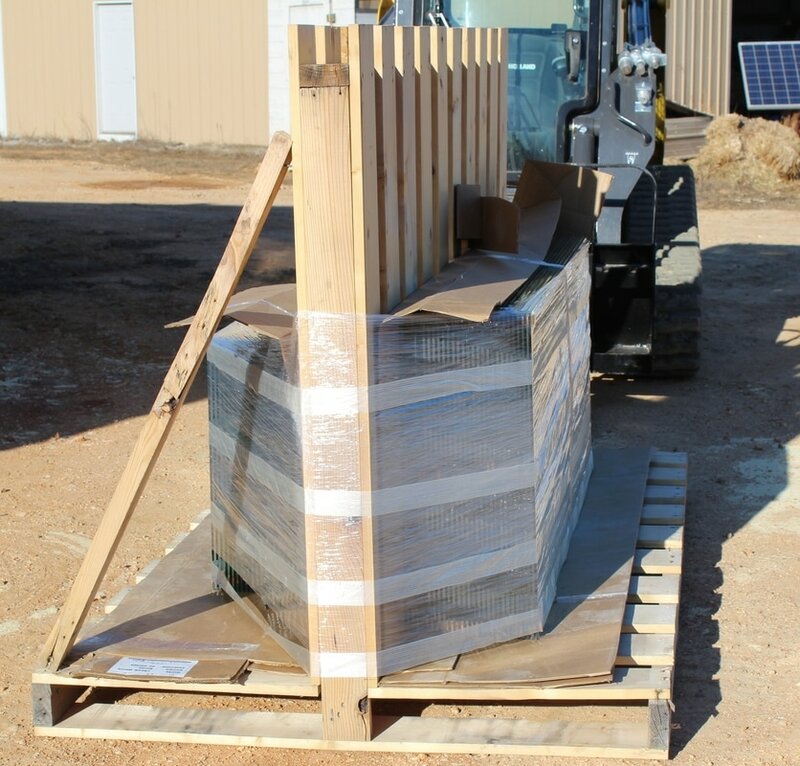 We poured 6 foot tall footing pads to place the solar hot water heater on. With about 4 feet buried in the ground. Instead of buying expensive forms Allen made his own using scrape lumber that we had laying around. 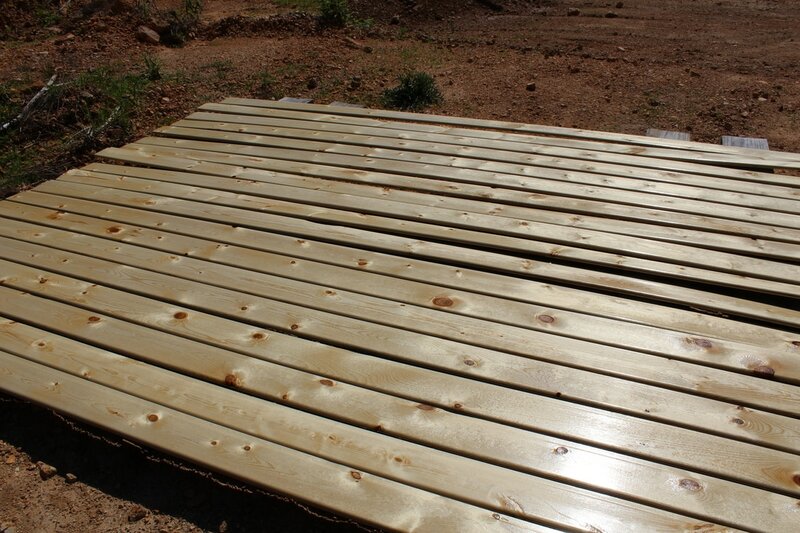 We used exterior paint with borox mixed in to help with moisture and bugs from eating the wood. 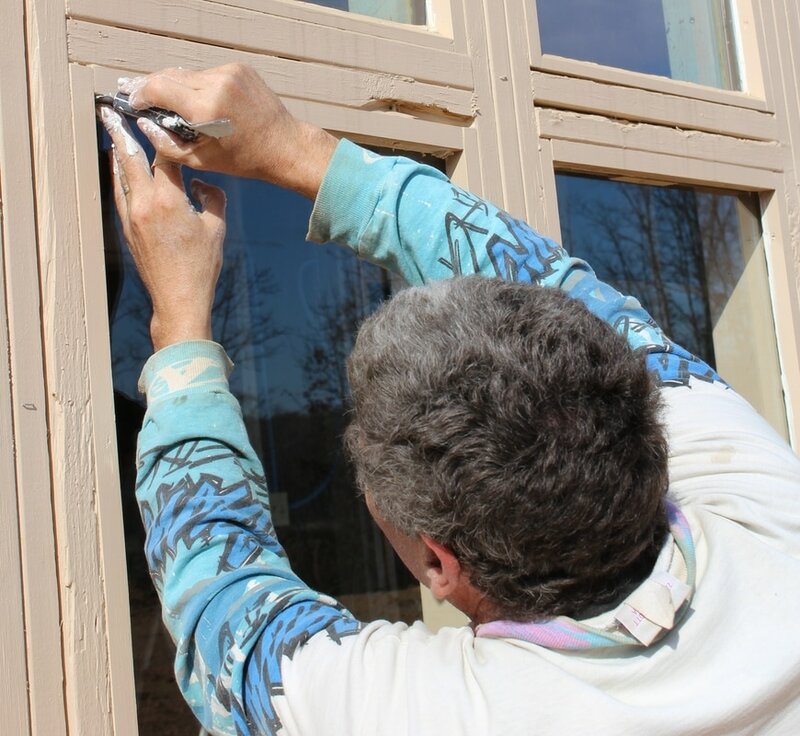 Mary will be papercreteing the exterior to help protect the exterior from the elements. 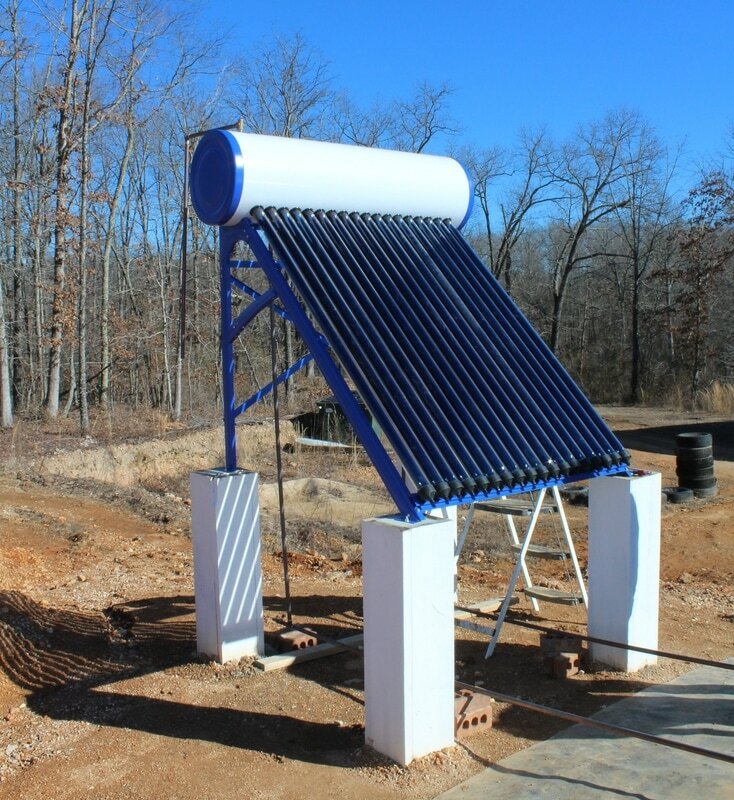 Allen has the cold water copper pipe going to the solar heater and the pipe for the hot water to come out. 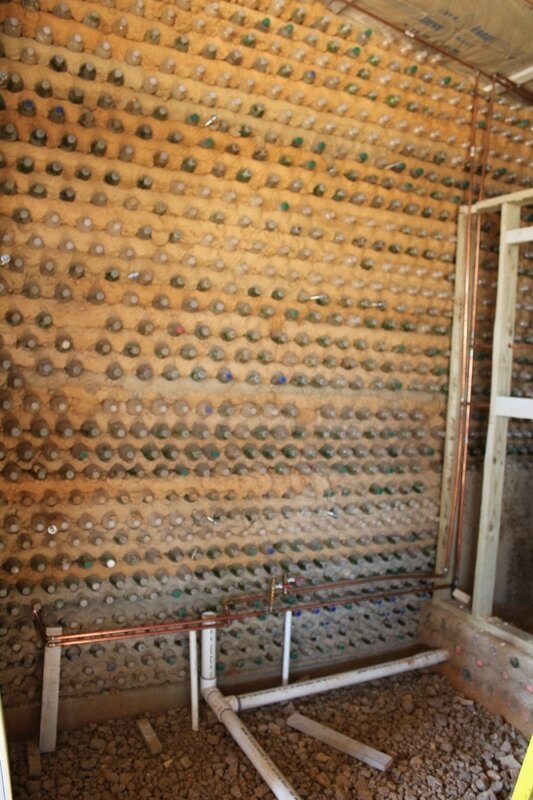 We will be covering the copper pipe with pipe insulation and then sealing it with papercrete all so. This will keep the water from freezing so it can be used year round. Since this is not hooked up to water yet we will not be installing the glass vacuum tubes until it is. The tubes collect the heat from the sun and travels up the tube into the 40 gallon, insulated, stainless steel storage tank above. We will have an on demand hot water heater that will run on propane inside the house as well. This is mainly for those cloudy winter days when we have no sun and for when we want to take a late night shower. Since the storage tank is insulated it would take several hours for it to cool down. The on demand heater will read the temperature of the water coming into it and adjust how long it would need to run for based on those temperatures. The cups on the bottom will hold the vacuum tubes in place. We have the port for the tubes to fasten in to in the tank sealed with cork screws. So bugs like mud wasps don't build homes in it. The copper pipe the comes from the top of the tank to the back is for the pressure release valve. Since this solar hot water heater is a pressurized system in the event there is too much pressure there is a way to release it. We would like to thank our many followers that we have for your interest in our project. This blog was orginally set up so our friends and family from Wisconsin could follow our adventure. We did not realize how many people we don't know would be following our progress as well. Through our journey we have made many new friends in this new land that we are now in. You all have made us feel very welcomed here. And the support from those out of our area has been great. Not everyone understands why we are doing what we are doing. The support helps us in moving forward no matter how long it is taking to complete. Thank You. We are now sending out emails to let our faithful followers know when a new update is posted to the websight. If you have not done so you can click on the link on the top of our page that says to be notified of updates and we will add you to our email list. Down the road when you don't want us sending you emails any longer just let us know by email and we will take your name off of our list.